We recently visited 12 Louisiana plantations along Louisiana’s River Road between Baton Rouge and New Orleans. Louisiana’s River Road parallels the east and west banks of the Mississippi River for about 70 miles (about 100 miles of actual road) through the Louisiana parishes of St. Charles, St. John, and St. James. Prior to the American Civil War, this river road was lined with approximately 350 antebellum plantation homes, from relatively simple farm houses to grand Versailles-like mansions. Many early Louisiana plantations grew rice, indigo, or tobacco, but by the mid-nineteenth century the majority were growing sugar cane, which became the most profitable cash crop in the state. Louisiana would become the most wealthy state in the country by the onset of the Civil War, made possible only by the forced hard labor of thousands of slaves who worked at these plantations. Not surprisingly, the Civil War and the end of slavery left most of the large plantations unprofitable, and many Louisiana plantations slowly declined into states of ruin or were converted into industrial estates. Today, the River Road reflects both the past and present, winding past bayous, levees, strip malls, oil refineries, sugar cane fields, historic communities, majestic live oaks, and a handful of remaining plantation mansions. Over a dozen of the plantation homes are open to the public for tours, and all are different so it can be difficult to decide which to visit. Some tours focus on the lives of the owners, some focus on historical furnishings, and one is dedicated to slavery. One is a family owned working sugar cane plantation, one includes 37 buildings listed on the National Register, one allows you to tour with your dog, and one is framed by a famous oak alley. Several have restaurants on the premises and a few offer on-site accommodations. Here is our comprehensive guide to the Louisiana plantations along the River Road, complete with a FAQ section, a short guide to each of the 12 visited plantations, and our own personal impressions of each! Best time of year to visit Louisiana plantations? Cost of Louisiana plantation tours? Louisiana River Road plantation discounts? How to get to the River Road plantations? How do I book a plantation tour? How many plantations can I visit on a day trip? How to Decide Which Louisiana Plantations to Visit? Further resources about the River Road Plantations? 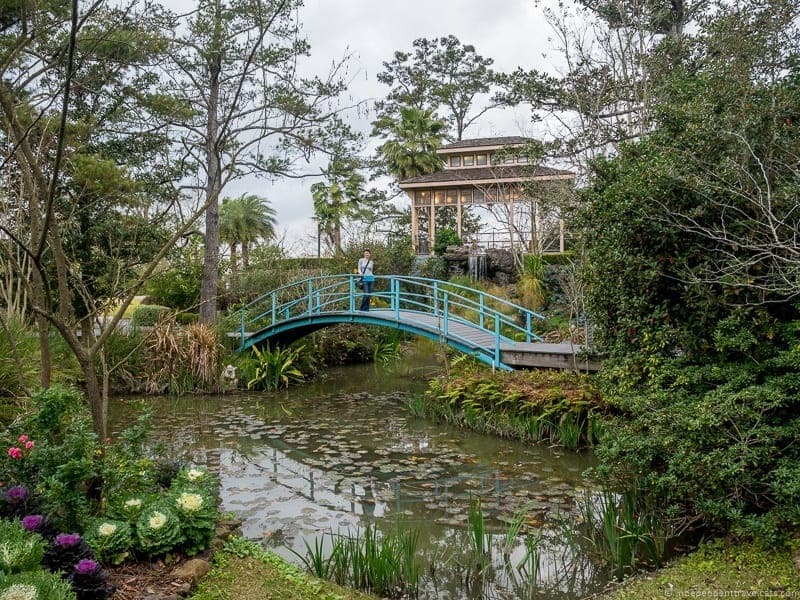 There are a number of Louisiana plantations open to visitors, and below we cover 12 plantations that we have personally visited, that are situated along the Mississippi River in between Baton Rouge and New Orleans, and are regularly open for public tours. We did not include plantations that are only open infrequently to the public or plantations located north of Baton Rouge (there are several) or ones more further afield in the state. While it may seem that all plantation tours would be the same, the houses, tours, exhibits, and atmosphere of each plantation is different. Most travelers have limited time and budgets, and it can be difficult for visitors to narrow down which might be the best fit. We have created the following FAQ to help readers decide when to visit the Louisiana plantations, how to visit the plantations, and which plantation(s) to visit. Plantations tours vary in price but are not cheap. They generally range from about $15 to $25 per person and all include a guided tour. Tipping of plantation tour guides is appreciated and often expected if you enjoyed the tour, but is not obligatory. Discounts are available at many plantations for AAA members, seniors, children, active military, and local residents. There are also some local discount cards, such as the New Orleans Pass, that may include free entry into some of the plantations. The New Orleans Pass currently (as of December 2018) includes free entry to both the San Francisco Plantation and the Oak Alley Plantation (as well as Long Vue House & Gardens which is also worth a visit). The best way to get to most of the Louisiana plantations is to drive there as public transit options are very limited in the area. If you don’t have your own car, you can join a group bus tour, a private tour, or hire a private car service to take you to the plantations of your choice. There are a lot of options from New Orleans for tours (group and private) but almost no tour options from Baton Rouge (consider a car rental or private transfer option). 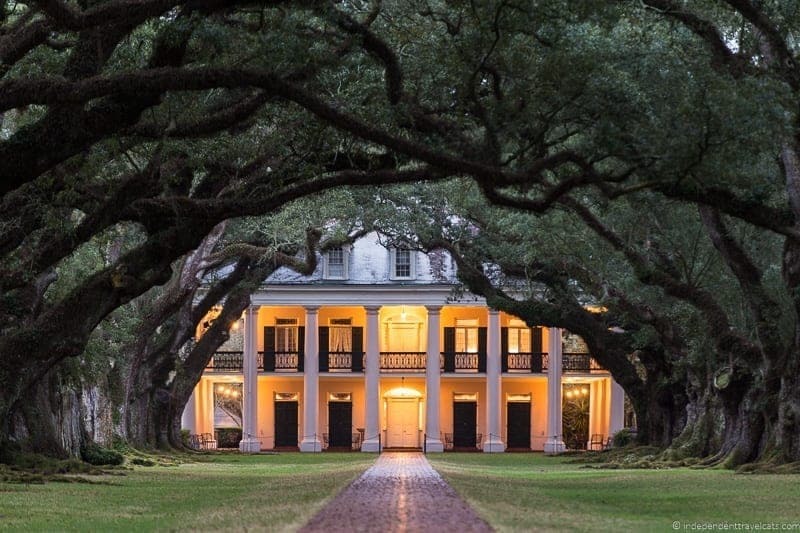 This day tour from New Orleans give you the option to visit 2 plantations of your choice from the following: Oak Alley, Laura Plantation and Whitney Plantation. This guided tour visits both Laura Plantation and Oak Alley Plantation. This small group tour from New Orleans visits Houmas House and Madewood Plantation and includes lunch. This small group tour from New Orleans visits Whitney Plantation and St. Joseph Plantation. 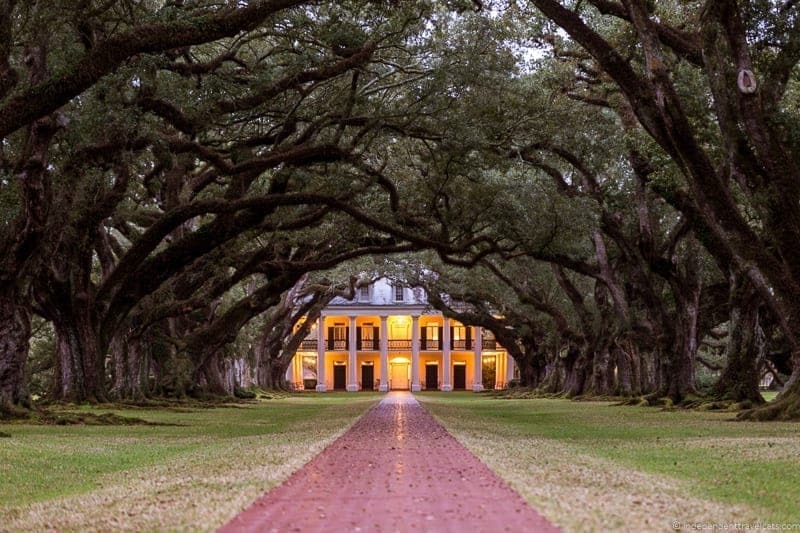 This half day tour takes visitors along the River Road and then allows them to choose to visit one of the following plantations: Oak Alley, Laura Plantation or Whitney Plantation. This full day tour includes visits to Oak Alley and Laura Plantation, lunch, and a Cajun swamp tour. If you want a private and customized tour (so you can visit whichever plantations you wish) you might consider this 6 hour private tour. To find more tour options, we’d recommend checking out Viator’s tours as they offer lots of different day tours, both group tours and private tours from New Orleans. Private transportation services in the area include Flagship Limousine LTD. and Five Star Transportation. Note that there are taxis and Ubers; however, many people who have used Uber have found themselves stranded at plantations for long periods of time because there are few drivers who will do pick-ups from this area. So you are better off arranging a day tour, private transfer, or scheduled taxi (with pick-up and drop-off arranged in advance). Tour reservations are generally unnecessary (however, be sure to call ahead for tours at Poché Plantation or Ormond Plantation) unless you are traveling in a large group. However, a few of the plantations offer the ability to book tour times in advance online or by phone, such as Whitney Plantation, San Francisco Plantation, and Destrehan Plantation, and this is wise to do if you know when you want to visit and are limited on time. If you do not have a reservation, I would advise showing up 30 minutes or so before the tour time you want to better ensure you get your desired time as tour times do sometimes sell out. First I would recommend looking up tour times in advance, and you should allot at least 2 hours to visit each plantation plus travel time. Some plantations you may want to eat at or enjoy the grounds so you’ll want to allot more time. Best to plan ahead about lunch, some plantations serve food, some allow picnics on property, and there are also a few other food options along the River Road. In terms of how many plantations, most people are happy with visiting 2 plantations, but 3 plantations is definitely doable in a day if you plan ahead. Note that many plantations are not open 7 days a week and all close for certain holidays. 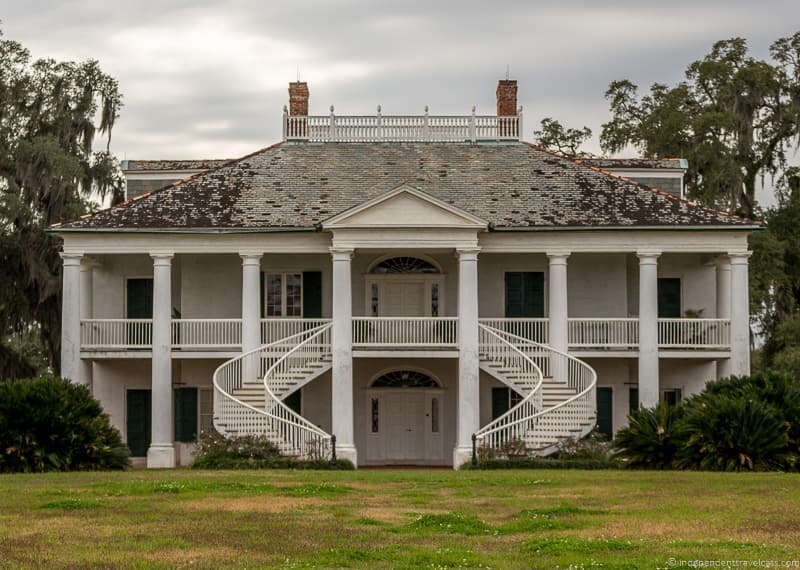 If you are really interested in exploring the plantation area between Baton Rouge and New Orleans, I’d consider spending the night to have more time to explore. You can sleep overnight at one of the plantations or sleep at one of the area’s hotels, motels, or B&B’s. For most visitors, a plantation visit is about seeing a historical home, an entertaining tour, and learning a bit about plantation life. However, for many visitors, the tours can be more emotional and powerful and hearing about plantation life, especially information about slavery, can really have an impact (whether positive or negative). Some visitors are going to be descended from plantation owners and some are going to be descended from former slaves; some may even be directly connected to the visited plantation. We met people who were both during our tours, some as visitors, some as owners, and some as staff. Some people are trying to learn or understand their heritage so it is good to be aware of this and try to be respectful with your questions, comments, and behavior. In no way should you feel guilty or afraid to ask genuine questions, but sensitivity would be appreciated by your fellow tour participants. Sometimes the insensitive comments may come from the staff themselves who may promote a romanticized view of plantation life. Some plantation tours do gloss over the horrors of slavery, and while this may appeal to some visitors, it can feel very insensitive to some visitors. So be mindful and hopefully this guide will help you determine which plantation tours may be a good fit for you, whatever your interests or background. Few of the Louisiana plantations along the River Road are fully wheelchair accessible. As historical homes, many do not have step-free access to their second floors. But several do have ramps and some even have elevators. Many offer wheelchair accessible toilets on site. Houmas House Plantation is probably the most wheelchair accessible plantation as it offers step-free access to both floors of the main house, restaurant, gift shop, and most of the buildings on the plantation property. There are even often golf carts with drivers who can help take those with limited mobility around the property! 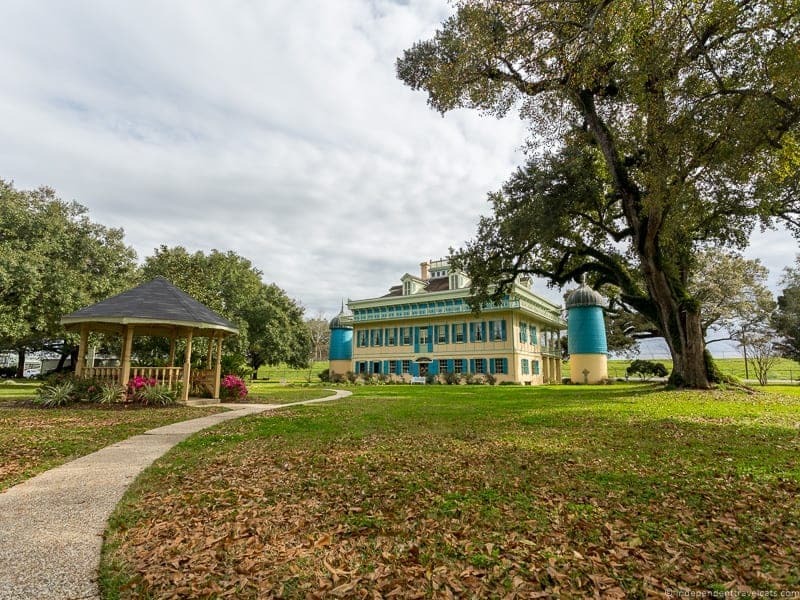 Another notable property is Destrehan Plantation which can offer step-free access for visitors to its main house, gift shop, and almost all the buildings on its property. Other plantations that those traveling with a wheelchair or reduced mobility may consider checking out are Nottoway Plantation, Oak Alley Plantation, Whitney Plantation, Ormond Plantation, and San Francisco Plantation as each offers partial wheelchair accessibility. Many of the plantations that offer overnight accommodation, can accommodate wheelchair users in certain rooms or cottages. For those with special needs or requirements in terms of mobility or accessibility, I’d call ahead to ask to see if needs can be safely accommodated. Tour guides in most cases can not provide assistance to guests (in terms of carrying wheelchairs, assisting people up stairs) during tours, and it is strongly recommended that guests who need assistance visit with a companion. After getting several questions related to handicap accessibility, steps, and wheelchair access from readers, we have tried our best to offer information related to accessibility for each Louisiana plantation. We now have a section on Accessibility under each plantation section listed later in the article. This information was provided to us by staff at these plantations and we do our best to keep it updated. If you have visited any of these plantations as someone with reduced mobility, we’d love to heard about your experiences in the Comments section at the end of this article. Your info can help future travelers! It can be difficult to choose which Louisiana River Road plantations you want to visit. Most people choose to visit two or three plantations. All are worth considering but all are different and will appeal to different people. We go over the best plantations for those looking for grand homes, historical information, slavery information, antiques, fewer crowds, photography locations, gardens, filming locations, and dozens of other factors to help you decide which are the best plantation homes for you to visit! 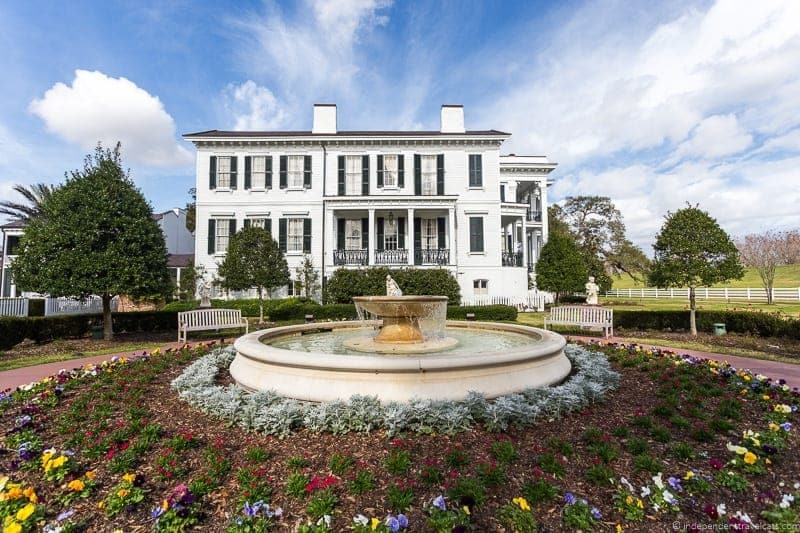 Most grand and opulent Louisiana plantations? Houmas House Plantation and Nottoway Plantation were probably the most grand with the most opulent furnishings. A third choice would be Oak Alley but it does not quite have the size or grandeur of the other two. 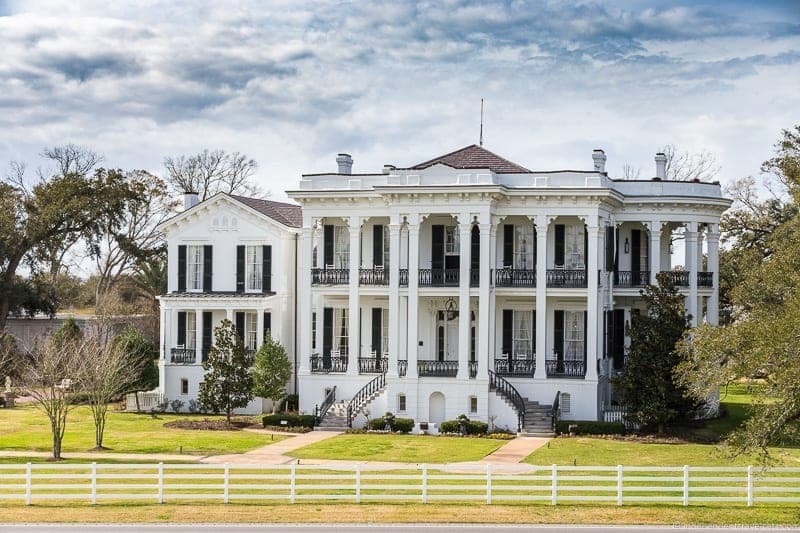 These are the three plantations I would highly recommend checking out for those looking for grand plantations and those in search of something that will remind them of Tara or Twelve Oaks from Gone with the Wind. These are also three of the most popular and busy plantations. Which plantations have tour guides in costumes? For those who like costumed guides (all in antebellum period dress), I’d recommend considering Oak Alley, Nottoway Plantation, Houmas House Plantation, San Francisco Plantation, and Destrehan Plantation. For those who are not fans of costumed guides, I’d suggest avoiding the above. Which plantations offer in-depth information on slavery? In recent years, plantation tours have begun to include more information about slavery into their tours and exhibits so the topic was at least mentioned in all of the house tours we took. 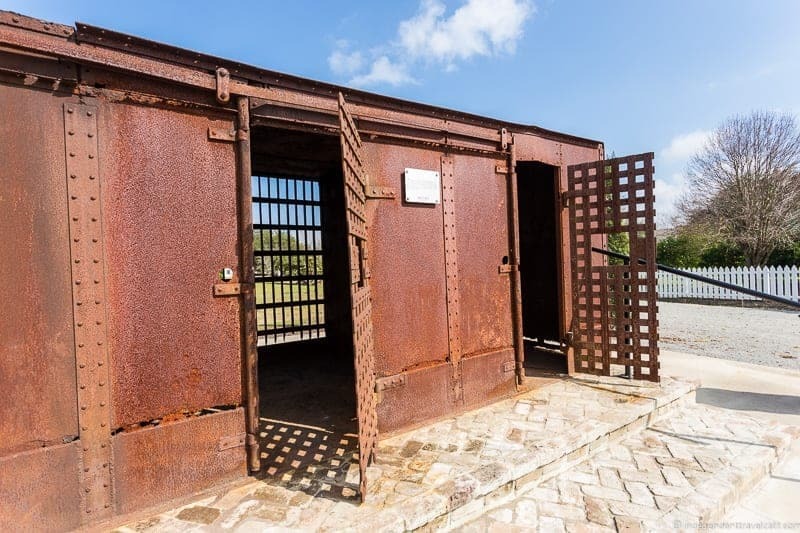 For those looking to learn about slavery and its role in Louisiana plantation life, Whitney Plantation is the only plantation tour dedicated to the topic and there are some wonderful slavery memorials on the property. Other plantations tours that seemed to have more of a focus on slavery were Laura Plantation and Evergreen Plantation. Magnolia Mound Plantation also offers a self-guided “Back of the Big House” tour focused on slavery and the role of African-Americans who lived at the plantation. Notable exhibits on slavery were also at Destrehan Plantation and Oak Alley Plantation. Which plantations are still working plantations? St. Joseph Plantation is a family-run working sugar cane plantation and has been run by the same family since 1877. 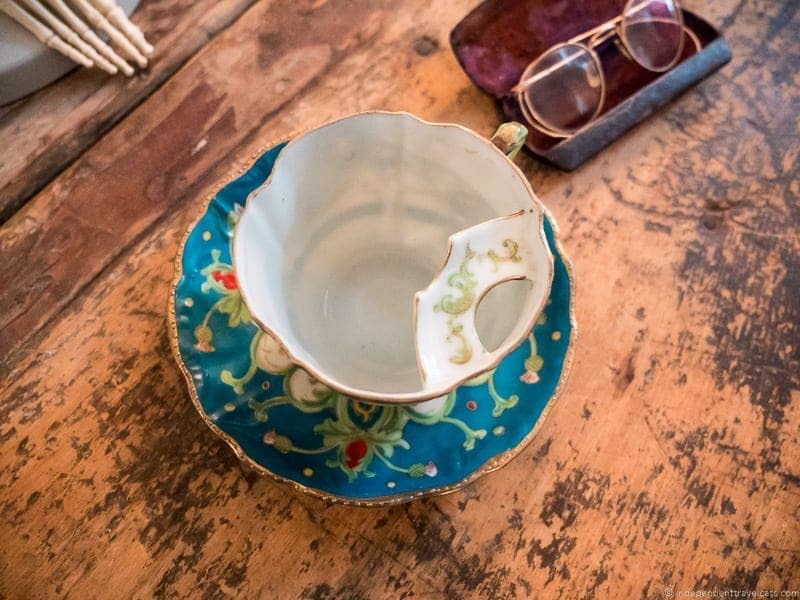 The guided house tours and gift shop are primarily run by family members so you’ll like get the chance to speak to people who have a true connection to the house and property. Evergreen Plantation is also a working plantation with the land leased out for sugar cane production. Which plantations have the best furnishings and antiques? All the plantations houses are at least partially furnished and all contain at least some antique pieces, but few have many original furnishings. Magnolia Mound Plantation stood out for its authentic colonial, Louisiana, and French antiques (most not original to the house) and the great depth of knowledge the guide seemed to have on the collection. Houmas House also had a lot of antique pieces on a much more opulent and elegant scale and several were pointed out during the tour, although few were original to the house. St. Joseph stands out as having probably the most original family pieces, many from the Reconstruction era. Which plantations are most intact with original dependencies? In addition to the main house, plantations would have historically had dozens of other buildings such as barns, slave cabins, overseer’s cottages, mills, etc. The most intact plantation on the River Road is Evergreen Plantation with numerous surviving dependencies (although some have been highly renovated), including 22 slave cabins. Laura Plantation and St. Joseph Plantation also have a number of original dependencies on the property that you can see. Many of the other plantations have antebellum buildings on the property for viewing that have been moved from nearby plantations or reconstructed buildings using period-consistent techniques, including Magnolia Mound, Oak Alley, Destrehan Plantation, and San Francisco Plantation. Which River Road plantations have the best gardens? Houmas House Plantation had by far the best gardens during our visit, featuring both native flowers and plants as well as exotic ones. Laura Plantation also had smaller but notable gardens and Evergreen has a formal hedge garden behind the house. Most of the rest of the plantations have only small gardens or no gardens at all, but most have landscaped grounds and majestic oak trees. 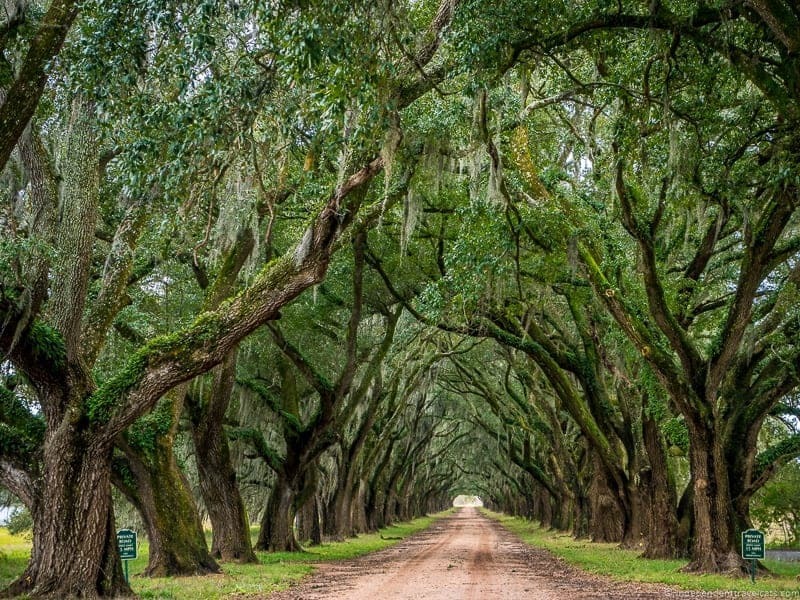 Which Louisiana plantations have the best oak alleys? Both Evergreen Plantation and Oak Alley Plantation have gorgeous oak alleys. Oak Alley has two actually, with one being the famous one framing what would have originally been the front entrance to the main house. Evergreen Plantation has a much longer oak alley that is draped with the characteristic Spanish moss (missing at Oak Alley). I think that all the plantations we visited have grand oak trees on the property, many of the trees being over 200 years old with the trees at Houmas House, Whitney Plantation, and St. Joseph’s standing out in my mind. 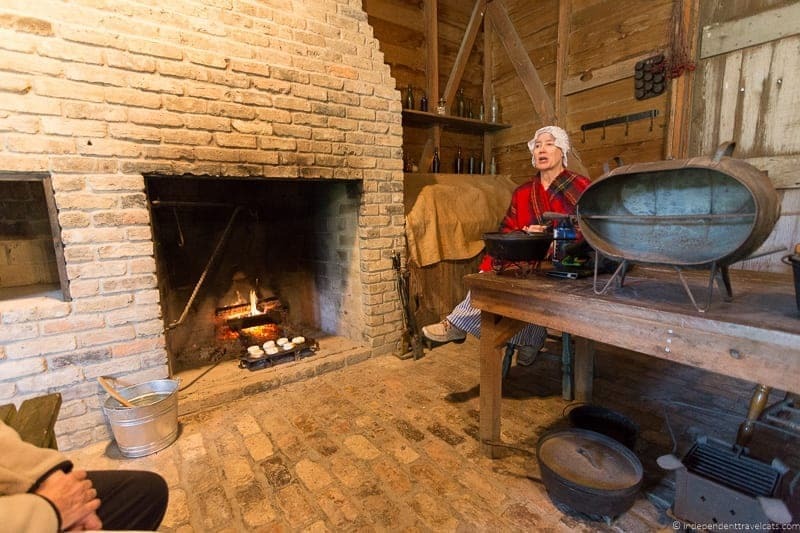 Destrehan Plantation offers the most variety and most frequent period craft demonstrations, with demonstrations and lectures on about a dozen different topics including blacksmithing, cooking, bousillage, and carpentry. 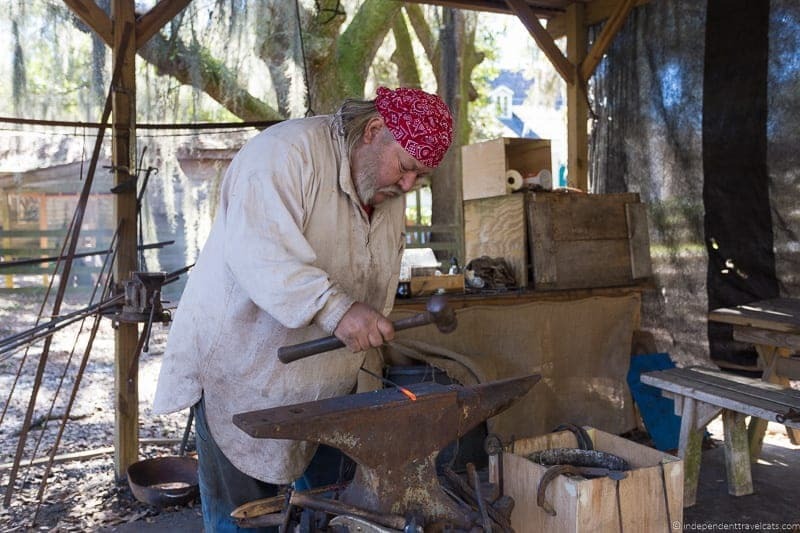 Oak Alley also regularly offers blacksmithing demonstrations using its original 1890’s forge. Which plantations have the best gift shops? Most of the plantations have gift shops. Those with the largest gift shops include Oak Alley, Nottoway, Houmas House, and Destrehan Plantation. St. Joseph was notable for its unique handmade items (I bought a pair of locally made earrings), Whitney Plantation for its selection of books, particularly on the subject of slavery, Oak Alley for its food items, and Destrehan for its on-site handmade blacksmith items. Best plantations for history buffs? All of the plantations have wonderful historical homes and information so I think all have some appeal to history lovers. The history of the plantations here spans the time when Louisiana was held by the French, Spanish, American, and Confederate governments, making for some interesting history. Destrehan Plantation stood out in terms of history as it is very well documented and visitors have access to hundreds of historical documents and artifacts, even a document signed by Thomas Jefferson. Others that stood out a bit more were Magnolia Mound Plantation, Evergreen Plantation, San Francisco Plantation, Laura Plantation, Whitney Plantation, and St. Joseph Plantation. The majority of house tours focus on the antebellum period, with Magnolia Mound being the most focused on colonial history, Whitney Plantation on history from a slavery standpoint, St. Joseph on the Reconstruction era to present, and Laura Plantation on the history as experienced by one family over the generations. All of the plantations offer something for a photographer. Oak Alley is the most photographed of the plantations and the shot of the oak alley framing the house is stunning; however, just about everyone takes this photo. If you really want to photograph it, we’d highly recommend staying overnight so you have legal access to the property at sunrise and sunset as we did. The Evergreen oak alley is also stunning and it shades 22 original slave cabins in their original positions. 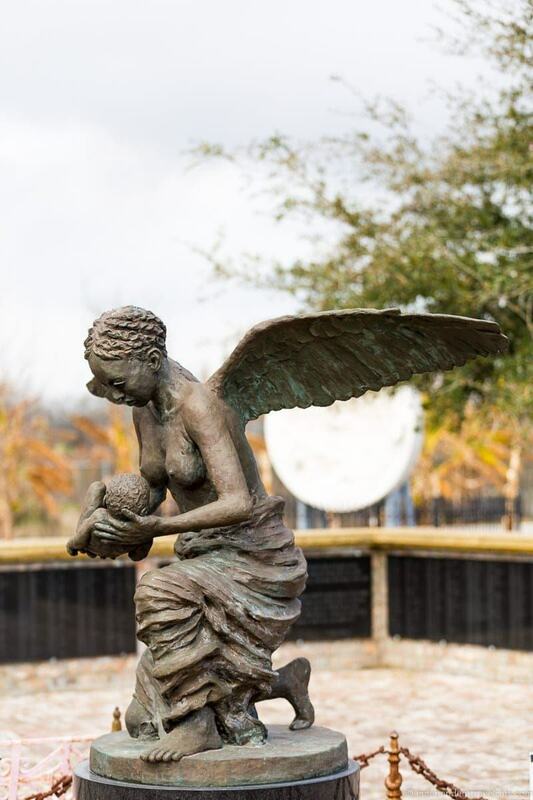 The statues of the slave children and angel memorial at Whitney Plantation are quite emotionally powerful. San Francisco Plantation is the most colorful and probably unusual in terms of architectural features, and you’ll also find some color at both Laura and Poché Plantation. Laura has a couple interesting looking derelict dependency buildings (especially the old mother-in-law). The restored interiors of Nottoway, Oak Alley, and Houmas House are quite impressive, especially the White Ballroom at Nottoway. Houmas House has the most impressive gardens. Neither Magnolia Mound nor San Francisco allowed interior photos during the times of our visits. For those wanting to do professional or commercial photography or filming, most plantations can arrange for shoots outside visitor hours for a fee. Best plantations for architecture lovers? This is a hard question and we are not experts in architecture, but the 12 plantations we visited represented a range of architectural styles and I would recommend choosing plantations with differing styles. Originally the most common style of the plantation houses in the late eighteenth to mid-nineteenth century was the raised French Creole style (or Spanish Creole or West Indies style). For examples of this style consider Magnolia Mound, Laura Plantation, St. Joseph Plantation, Ormond Plantation, and Whitney Plantation. Then in the mid-nineteenth century many houses were built in the Greek Revival style and many of the Creole style houses were converted to Greek Revival. For Greek Revival houses (or those restyled in this manner) consider Houmas House, Nottoway Plantation, Oak Alley Plantation, Destrehan Plantation and Evergreen Plantation. You also get a few unique houses built later in the nineteenth century that took on different styles such as Victorian Renaissance (Poché Plantation) and Steamboat Gothic (San Francisco Plantation). 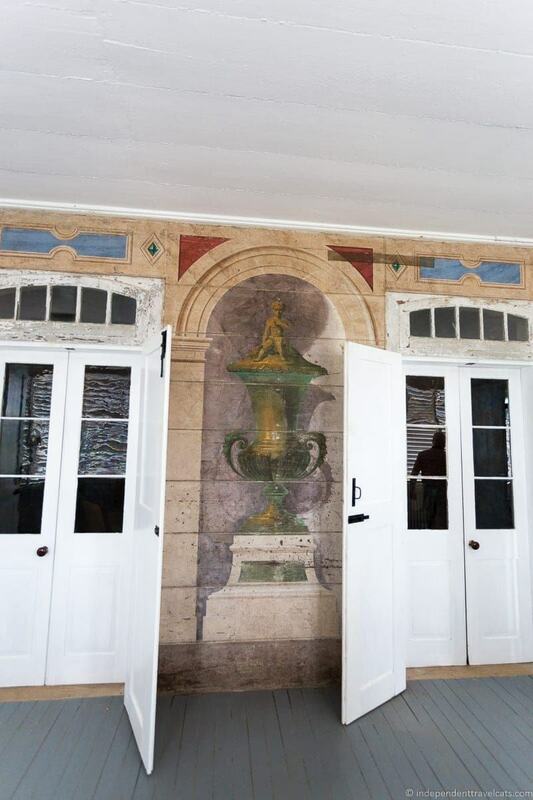 Other unique features include the painted ceilings in San Francisco Plantation and the original painted murals (interior and exterior) at Whitney Plantation. Some of the plantation’s main houses have been heavily restored and renovated (e.g., Evergreen, Oak Alley, Houmas House), some have focused more on conservation and preservation (Magnolia Mound, St. Joseph, Whitney), and Laura was almost entirely rebuilt following a 2004 electrical fire. Best plantations for movie lovers? Almost all of the plantation houses or properties have been used for filming, whether it be commercials, TV series, films, or music videos. Oak Alley, Houmas House, Destrehan, Whitney, St. Joseph (and sister property Felicity Plantation), and Evergreen Plantation have all been used for major American movie or TV productions. Filming was happening or had recently happened at several of the plantations we visited during our trip. Some popular films and series shot at River Road plantations were Interview with the Vampire, 12 Years a Slave, Primary Colors, The Skeleton Key, Hush Hush Sweet Charlotte, Django Unchained, and the 2016 Roots mini-series. See specific plantation guides below for which movies were shot where. Most haunted River Road plantations? Plantations are often considered to be haunted places, generally related to suicides or mysterious deaths of the plantation owners or wrongful deaths of slaves. Laurence and I are not very into haunted places or the paranormal, but since something related to hauntings or ghosts was mentioned enough in the tours I thought I’d mention it. Oak Alley, San Francisco, and Houmas House all had mentions of the paranormal on the tours we did. However, the most interesting real-life mystery stories had to be at Ormond Plantation with the mysterious disappearance of one owner and the hanging of another! If you want to learn more about the haunted histories and ghostly tales related to Louisiana Plantations, consider getting a copy of this book. Least crowded Louisiana River Road plantations? The crowds at some plantations can make a visit much less enjoyable for some people. Some plantations we’d suggest considering for a less crowded experience would be Magnolia Mound Plantation, St. Joseph Plantation, Evergreen Plantation, and San Francisco Plantation. Whitney Plantation tends to attract a more serious traveler but is now a part of many bus tour stops so now has more visitors. Ormond Plantation as a bed-and-breakfast and Poché Plantation as a bed-and-breakfast/RV park are also great bets for a crowd-free experience; free tours are included with a stay at either of these plantations. 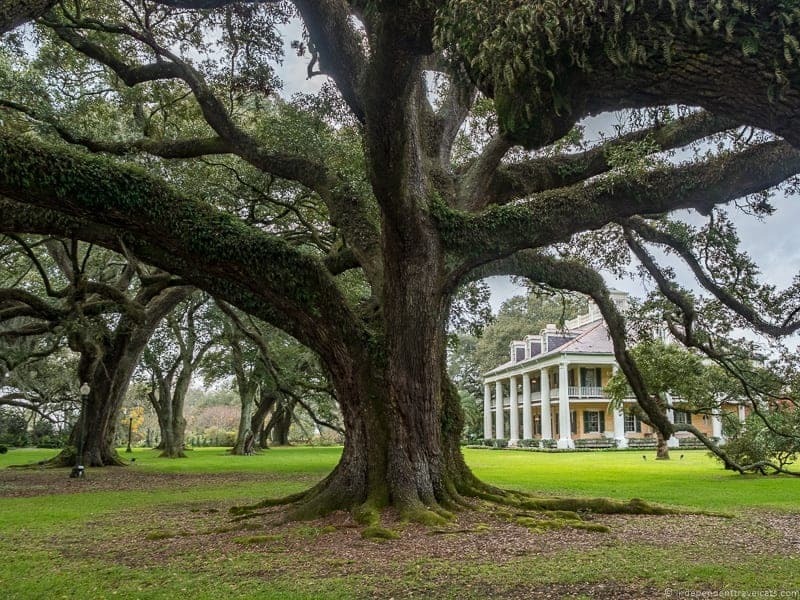 Several of the plantations are very popular group bus tour stops, including Oak Alley, Laura Plantation, Whitney Plantation, and Destrehan Plantation. These can get very crowded at times. If you are interested in visiting the busier plantations, best tip for avoiding huge crowds would be to get on the first or last tour of the day. You can also call ahead and ask the best times for a given day as big groups have to schedule in advance at most of the plantations. We’ll share where to eat, drink, and stay in Louisiana’s Plantation Country along the River Road. We share lots of options between Baton Rouge and New Orleans. Many plantations offer on-site restaurants, cafes, and even accommodation options. Where to eat between Baton Rouge and New Orleans? The predominant type of cuisine served in the area is Cajun (or Creole). You’ll also find general American and Southeastern favorites. We recommend trying local Cajun favorites like jambalaya, gumbo, rice and gravy, etouffee, Andouille sausage, crawfish, and boudin. Po’ boys, fried catfish, fried chicken, fried green tomatoes, cornbread, pecan pie, and other Southern and New Orleans dishes are also very typical here. Grapevine Cafe in Donaldsonville – Quirky and colorful restaurant featuring local art, live music, and Cajun foods. Serves Cajun classics as well as steak and seafood. Full bar. Lunch, dinner, and Sunday brunch. Spuddy’s Cajun Foodsd in Vacherie – This well-loved simple place serves homestyle Cajun favorites like po-boys, gumbo, and fresh handmade sausages. Serves lunch, coffee, and snacks. Nobile’s Restaurant and Bar in Lutcher – A restaurant in a historical building serving a mix fo Cajun and American dishes. Baba is their signature dessert. Serves lunch and dinner. Fatty’s Restaurant in Garyville – Casual spot serving Cajun dishes such as gumbo, jambalaya, etouffee, and stews along with the typical American food. Serves lunch and dinner. Buddy B’s in Garyville – This long-time local family restaurant serves up casual Cajun and American dishes. Serves breakfast and lunch. Wayne Jacob’s Smokehouse & Restaurant in LaPlace – Best known for their smokehouse Andouille sausage, brisket, and other meats. Also serve a number of other Cajun and American classic dishes, including burgers, po’boys, salads, and fried catfish. Serves lunch and Sunday brunch. Truck Farm Tavern in St. Rose – Family-friendly restaurant serves homestyle and comfort American food as well as seafood and BBQ. Serves lunch and dinner. Although there are several of dining options in the area, many are not open daily so check current hours before deciding where to go! Note that many of these are not open for dinner and most close fairly early. Many are also not open on weekends. So it is always a good idea to figure out what you plan to do for dinner before evening comes around if staying in the area. Sometimes the nearest option may be a 30 minute drive away. For those visiting this area on a day trip, I’d try to do lunch at one of the plantations to save time as several have dining options for lunch. There are also grocery stores in the area where you can pick up food for picnics and meals if you have a self-catering accommodation. Which plantations offer places to eat? Currently, the following plantations have at least one on-site eatery or restaurant: Nottoway Plantation (all 3 meals and snacks), Oak Alley Plantation (breakfast, lunch, drinks), Houmas House Plantation (all meals, drinks, dinner reservations needed), and Ormond Plantation (lunch and dinner, dinner reservations needed, not daily). Reservations are not usually necessary for lunch, but they are typically needed for dinner. Plantation restaurants are not typically open 7 days a week so do check ahead. Both Oak Alley Plantation and St. Joseph have picnic tables that you can use if you bring your own food and Laura Plantation offers some vending machine food and refreshments in its gift shop. If you are staying overnight at a plantation, breakfast is normally included in the room rate. Which plantations offer overnight accommodation? The following plantations currently offer some form of overnight accommodation on the property, either in a cottage, an inn, or in the main house from north to south: Nottoway Plantation, Houmas House Plantation, Poché Plantation, Oak Alley Plantation, and Ormond Plantation. See next section for links to each. There is also a 13th plantation, Palo Alto Plantation which is not open to public tours (although they do weddings and special events) but they do rent out the Kitchen Cottage on the plantation. See Where to Stay section below for a description and links for each. If you want to stay overnight in an actual main plantation house, Ormond Plantation, Poché Plantation, and Nottoway Plantation offers rooms and suites in the main house. Poché Plantation is also a RV resort and offers spots and facilities for those traveling by RV or campervan. You can also read about when we stayed overnight at Oak Alley Plantation. 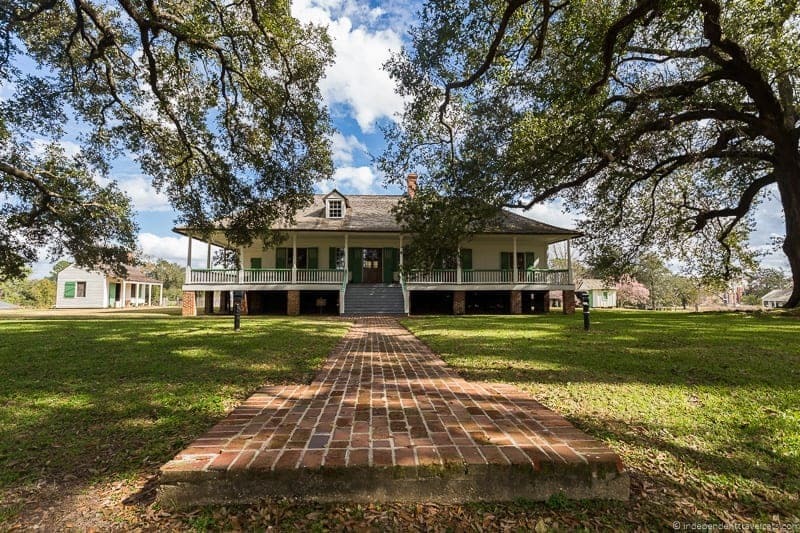 There is also Madewood Plantation near Napoleonville – this plantation is not along the River Road but it is not too far away (about 40 to 45 minutes). It doesn’t offer public tours but does offer accommodation in a 1846 plantation home plus another house on the property. A good option if you can’t find availability in any of those along the River Road. 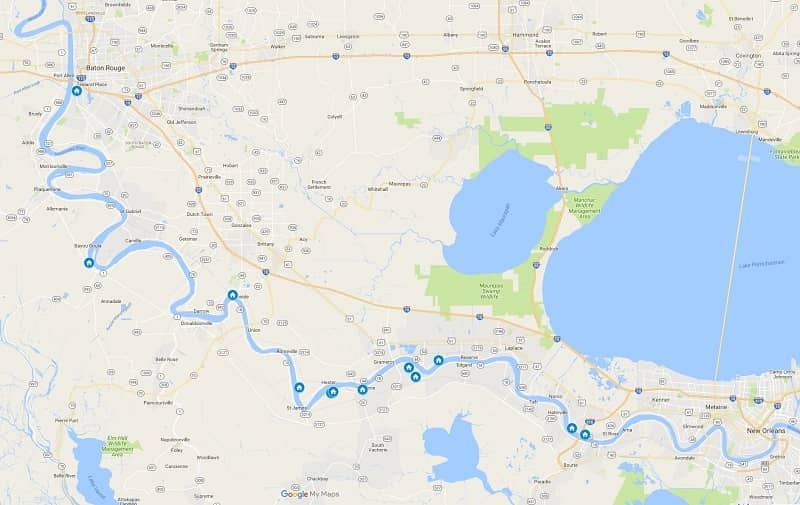 Where to stay along the River Road between Baton Route and New Orleans? If you are planning to stay a night (or two) along the River Road, there are a number of accommodation options. In addition to the plantations that offer on-site lodging mentioned above, there are also several traditional hotels, motels, bed-and-breakfasts, and Airbnb spots along the route. The towns along the route are fairly small in size so most have limited accommodation options, so it is good to book in advance if you can. Airbnb can also be a good option for those wanting to stay in a house, cabin, apartment, or room although options are more limited than in a city. You can check out Airbnb options in this area here. If this is your first time using Airbnb, you can get up to $30 off your first stay using this link. In terms of where to stay along the road, I’d decide on based on what plantations you want to visit, your route, and your destination. Here are some places to consider, north to south along the route. The Inn on the River in Donaldsonville – Hotel located in the historic downtown area that includes continental breakfast and has a pub. The hotel is in a converted 1911 brick building that originally housed a local department store. The single and double rooms have a modern feel while the suites have a historic feel. Holiday Inn Express in Donaldsonville – A well-rated chain hotel with an outdoor seasonal swimming pool. 170 year Old Plantation Kitchen Cottage in Donaldsonville – A renovated self-catering cottage that was once used as the kitchen dependency for the main house on Palo Alto Plantation. The main house and kitchen cottage are believed to date to circa 1847. Nottoway Plantation in White Castle – A plantation offering both rooms within the main house as well as within cottages on the property. Offers an on-site restaurant and resort style facilities. 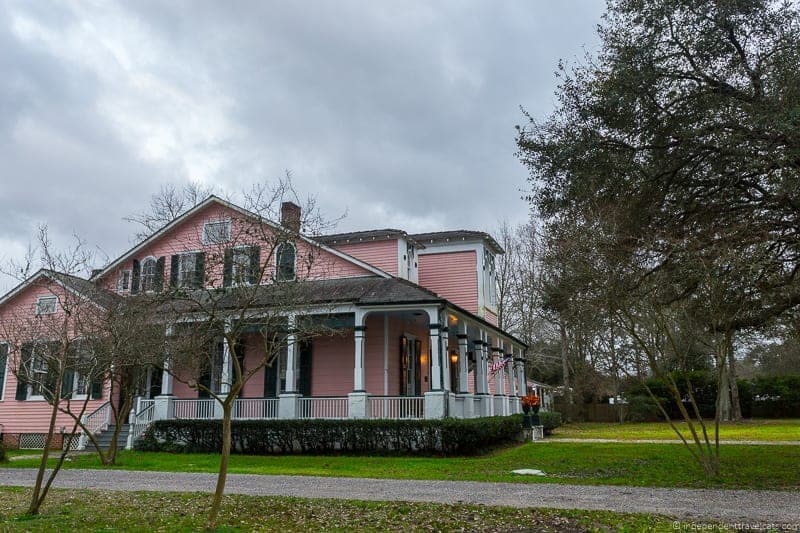 Houmas House Plantation in Darrow – This plantation offers rooms and suites in cottages on the property and has an on-site cafe and restaurant. Auberge Du Chene Vert in Vacherie – A family-run bed-and-breakfast with a large front porch and hot cooked breakfast. Cottage on the Farm in Vacherie – A 2 bedroom private cottage with continental breakfast. Currently only takes reservations by phone. Poché Plantation – This plantation offers B&B rooms in the main house and cottages, and is also a RV, campervan, and camping park. 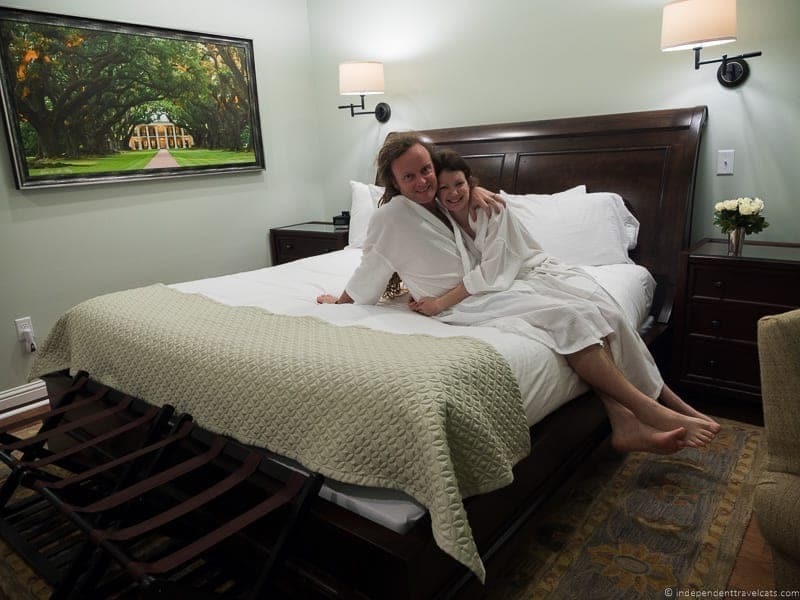 Oak Alley Plantation – Oak Alley offers accommodation in both historical and modern self-catering cottages on the same property as the plantation house. Breakfast included in restaurant and dinner can be arranged. Motel 6 in Luling – A budget motel with a seasonal outdoor pool. Diner located next door. La Quinta Inn & Suites in Boutte – A well-reviewed hotel with free breakfast and a seasonal outdoor swimming pool. Holiday Inn Express & Suites near Saint Rose – A 3-star hotel located 2 miles from the airport. Hotel provides free airport transfers and has a sun deck, outdoor swimming pool, and on-site restaurant. Ormond Plantation – This plantation offers rooms in the main house and includes breakfast. Dinner is sometimes available, depending on the day of the week. 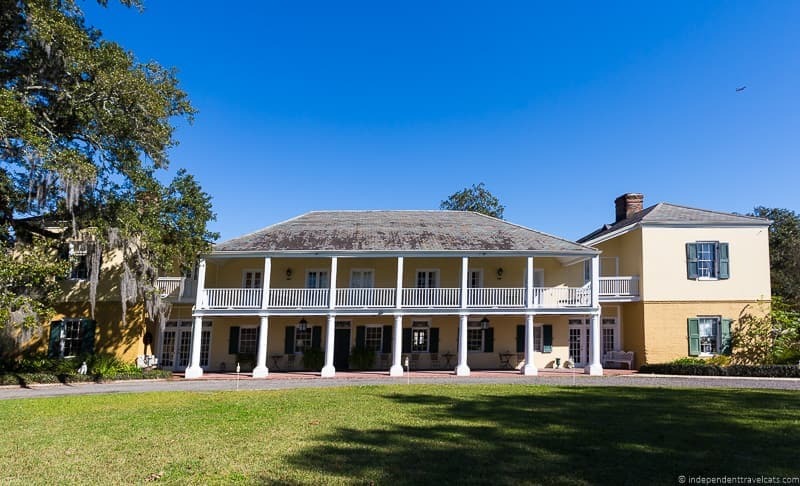 Destrehan Plantation – This plantation offers 2 guest cottages on site. Each plantation has its own website that will offer all you need to know about admission prices, tour times, whether tickets can be booked in advance, closure dates, restaurant openings, lodging booking, contact information, etc. and these links are all included below in this post. If you are looking for more information on planning your trip consider the Baton Rouge tourism website, New Orleans tourism website, New Orleans Plantation Country website (includes 10 of the 12 plantations included in this post), and Louisiana State Tourism website for those traveling further afield in the state. For plantations to visit beyond the River Road, check out this list of plantations located throughout the state. For books about plantations in Louisiana, you can check out Vestiges of Grandeur (beautifully photographed book of the past and current River Road plantations) and this Pelican Guide guidebook (plantations and grand homes throughout Louisiana). Laurence has also written a great posts about top things to see in Baton Rouge and our experience visiting New Orleans during Mardi Gras. We have created a short guide to each of the 12 River Road Louisiana plantations that lists the same criteria for each plantation for easier comparison. 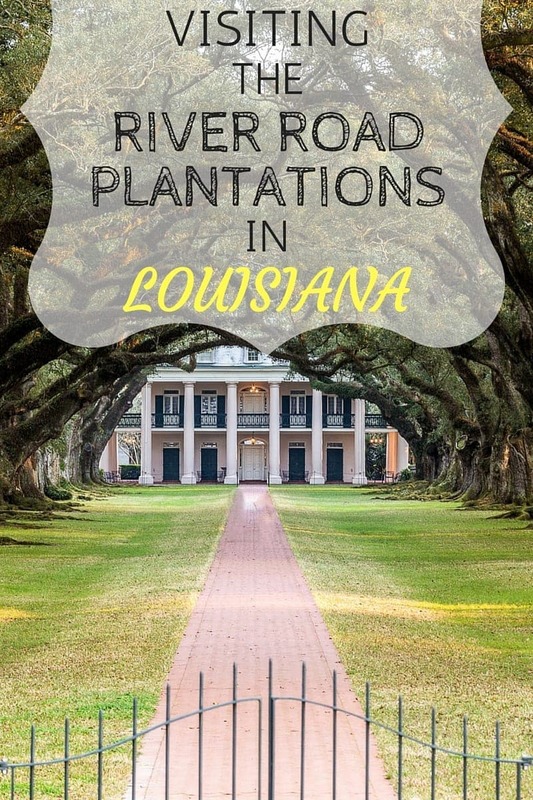 We also share our own personal impressions about our own visit to each of these 12 Louisiana River Road plantations. The plantations line the Mississippi River from Baton Rouge to New Orleans, and plantations are listed from north to south, starting with plantations closest to Baton Rouge and ending with those closest to New Orleans. Note that when driving, plantations are on both sides of the river so it is not a linear route. If driving, have a GPS or good map with the plantations marked as some are not well signed from the road. Below is a map of the River Road plantations. You can double click on the map photo or click here to see or interact with the detailed map. Magnolia Mound Plantation was originally built as a fairly humble settler’s home in the late eighteenth century, but was soon expanded to be the main home of a wealthy landowner. The plantation is an easy visit from downtown Baton Rouge and is known for its collection of Federalist, Louisiana-made, and French furniture and decorative art objects. Magnolia Mound may not be the grandest plantation home, but it is a great attraction for those who love historical homes and antiques. The focus here has been on the preservation and conservation of the property. Owners: The house was built in the 1790s by John Joyce, an Irish immigrant who had purchased the property from James Hillin. This house was originally built as a small 4-room settler’s house and later expanded to suit the needs of a plantation owner and his large family. It is currently run by The Recreation and Park Commission for the Parish of East Baton Rouge (BREC) which operates a number of parks and recreational sites in the area. Tours/Tour Guides: Main house can only be visited with a guided tour, but the gardens and other buildings are self-guided. For those interested in slavery, a special tour focused on slavery and plantation life is available but must be booked in advance. Tour guides are not costumed. Main House Furnishings: Few are original, but items are period consistent and many are notable antiques. Magnolia Mound is considered to have one of the best collections of Louisiana-made objects from the colonial period. It also includes French pieces from the same era. 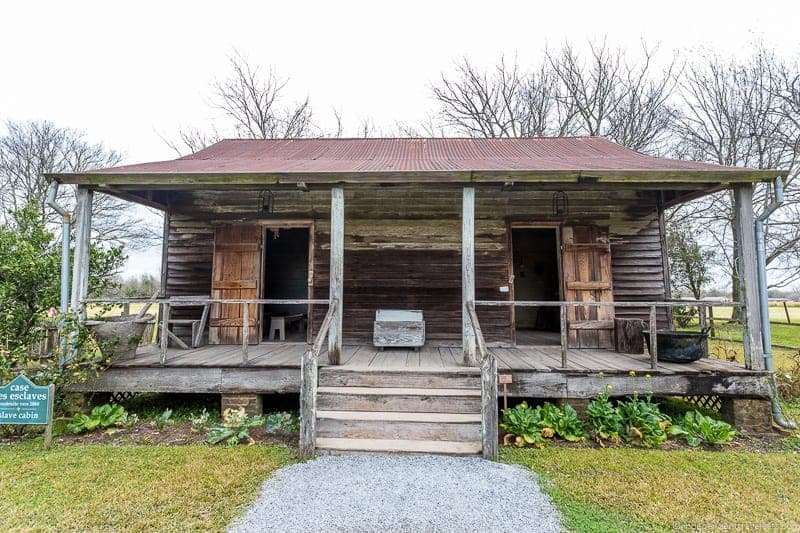 Other buildings to visit on property: The property also contains a reconstructed kitchen, a slave quarter house (antebellum, but moved from another former plantation River Lake Plantation), an original overseer’s house (c. 1870), an old well, and a pigeonnier (c.1820, but from another plantation). Slavery Information: There is a small amount of information on slavery on the main tour, but there is a self-guided “Back of the Big House” tour focused on slavery and the role of African-Americans who lived at the plantation. There is also an antebellum slave quarters building on the property for viewing. Gardens: There is a small kitchen garden, a small crop garden (sugar cane), and some grand 200+ year old live oak tress on the property. Photography Allowed: Photography was not allowed inside the main house, but was allowed outside and inside the kitchen and minor buildings. Accessibility: The main historical home at Magnolia Mound Plantation requires 10 steps to enter and exit; however all other main buildings on property have step-free access and are wheelchair accessible. These include the kitchen and gift shop. There are wheelchair accessibility toilets on site. Days Tours Available from New Orleans: We were not able to find any regularly operated day tours from New Orleans or Baton Rouge. Crowds: Small – this is not typically a busy property and is not very well-known in comparison to many of the other plantations. However, can get busy when school or bus groups arrive. Most Unique: The age of the property, state of preservation, antiques, and impressive knowledge of the guides of the house and antique furnishings. This is a great historical gem of a property located on the outskirts of Baton Rouge. On the day we visited, we were the only visitors for the next tour but we were joined as we started by another couple. The guide was very knowledgeable about the house and the furnishings. My favorite quote from the tour was “This floor [the original cypress floor] was laid while George Washington was president”. 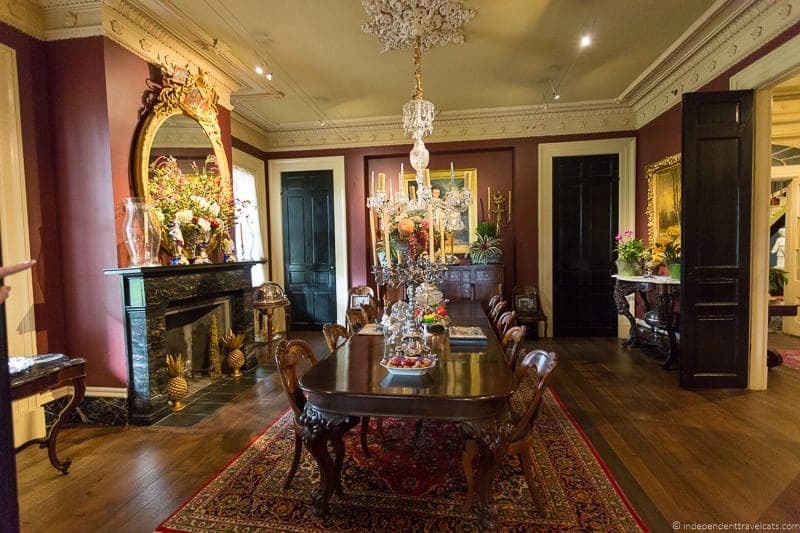 The period furnishings in this house and the attention to them made this tour stand out to all the others; we would highly recommend this tour to those interested in historical properties and antiques. We recommend leaving time to do the self-guided “Back of the Big House” tour focused on slavery. This is not a flashy Greek Revival mansion so it would likely not be a great fit for those looking for the most photogenic grand plantation homes. It is perfect for those looking for a more rustic plantation house where you can get a sense of the late 18th/early 19th lifestyle. Magnolia Mound Plantation is a great plantation to visit if you want to avoid the crowds you’ll find at many of the other plantation homes. Nottoway Plantation, known as the White Castle, is believed to be the largest surviving antebellum plantation in the American South. Built just 6 years before the Civil War, it is also one of the youngest and grandest of the Louisiana River Road plantations. Nottoway Plantation is perfect for those day tripping from Baton Rouge and looking for a grand plantation house. Owners: The house was built by sugar cane magnate John Hampden Randolph and he lived here with his wife and 11 children. The Randolph sold the plantation in 1889 and it was then in the possession of a series of owners. It is currently run and maintained as part of the larger resort and conference center that are also on the property. Tours/Tour Guides: Main house can only be visited with a guided tour, but the gardens and museum are self-guided. Tour guides are costumed in antebellum period clothing. Main House Furnishings: Some house furnishings are original, but most are period consistent pieces. 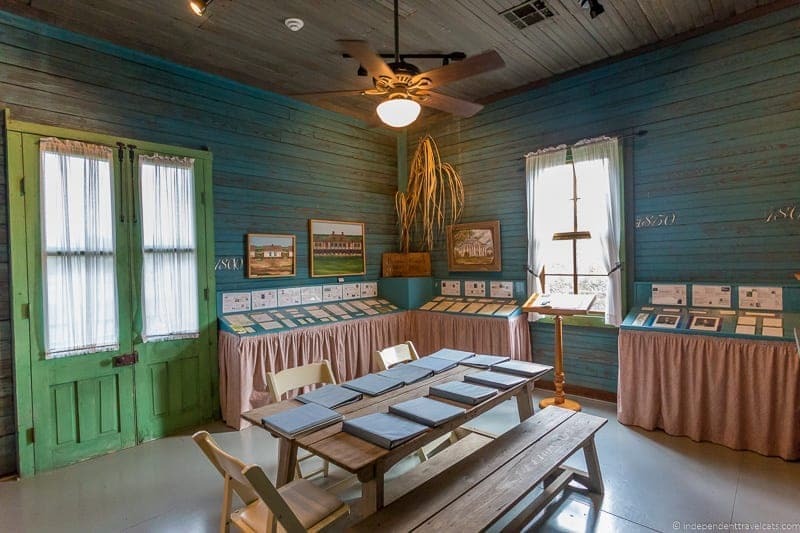 Other buildings to visit on property: There is a 2-room museum that provides more information on the house, family, and slavery at the plantation as well as a short film. There are no other historical places to visit on the property except a family cemetery. Slavery Information: There is a small amount of information on slavery on the main tour, and some additional information can be found in the small museum. Gardens: There are small flower gardens and some large 200+-year-old live oak trees on the property near the mansion. A path to a Mississippi River viewpoint is located near the front entrance to mansion, and is worth walking as you don’t see the river from most of the plantations as the levee blocks the views that these plantations once had. Photography Allowed: Photography is allowed throughout. Food: Yes, a cafe and a restaurant. Accessibility: The Nottoway Plantation tour has 4 steps to reach the 3rd floor of the main house. However, the house has an elevator and the other floors are wheelchair accessible. A visitor who cannot climb the steps can still hear the guide from outside on the 3rd floor. The gift shop, cafe, museum, and most of the garden paths are accessible. The cemetery is not wheelchair accessible. Wheelchair accessible toilets are available. Some of the overnight accommodations are wheelchair accessible and have roll-in showers. Days Tours Available from New Orleans: We were not able to find any regularly operated guided day tours to Nottoway, but should be able to arrange a private tour from New Orleans or Baton Rouge. Lodging: Yes, guests can stay in cottages on the property near the house or even in a few of the bedrooms in the main house. Resort facilities are also on the property. Check prices here. Crowds: Medium to Large – Many visitors come here to tour the opulent mansion (close to Baton Rouge) but the property also hosts a number of conferences and events. Most Unique: Opulent large furnished mansion, beautiful white ballroom, and guests have ability to stay in main house (or cottages). Nottoway Plantation is the largest antebellum mansion in the American South. 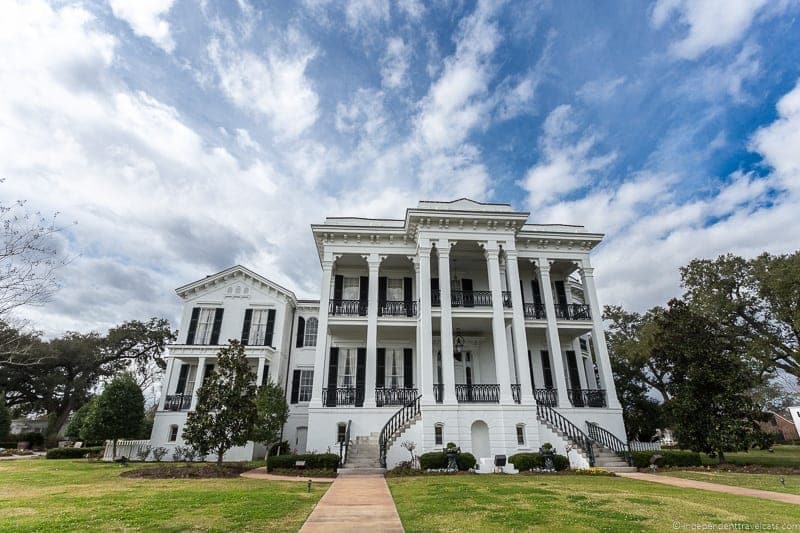 Nottoway Plantation is large, opulent, and beautiful–the 53,000 square foot mansion boasts massive exterior columns, hand-carved Italian marble fireplaces, detailed plaster frieze moldings, and modern conveniences. The main house tour contains a number of beautiful rooms, perhaps the most memorable being the White Ballroom. The tour guides are costumed but the atmosphere was fairly relaxed as we were even allowed to sit on some of the furniture. During the tour, there were interesting stories about how the green velvet curtains may have inspired Selznick for Gone with the Wind, how the youngest Randolph son ran off to New Orleans with the enslaved cook’s daughter and was all but written out of the family history, and how the plantation house managed to survive the Civil War with only a grapeshot hitting one of its columns. Definitely recommend visiting the small museum and watching the video before or after your tour. We had gumbo and jambalaya at the small cafe and found the food to be both tasty and a very good value. We’d recommend Nottoway Plantation for those looking for a grand and beautiful plantation house, some interesting stories of the Randolphs lives before and during the Civil War, and opulent furnishings. However, it is not going to be the best fit for those seeking information on slavery or plantation life; it also does not have any additional historical buildings to visit other than the main house. It is very convenient for those basing in Baton Rouge as it is the closest of the more grand plantation houses. Nottoway Plantation may also be a good choice for those wanting to spend the night in a plantation houses as only a few plantations houses allow guests in their main house. Houmas House Plantation is one of the beautiful restored Greek Revival plantation homes, nicknamed the Sugar Palace. However, the house is actually two houses connected by a carriageway and the dates of the original older house are still a mystery. Many believe, and we were told on the tour, that it is the original Latil house that was originally French colonial (circa 1775) but it was expanded and updated into a more Federal style over the years. It is known that the larger newer main house built in the Greek Revival style was built around 1840. The house is sumptuously furnished and the costumed guides tell the story of what it was like to live in the house during the time of the wealthy sugar barons. The plantation also has beautiful gardens, three restaurants, and overnight accommodations. 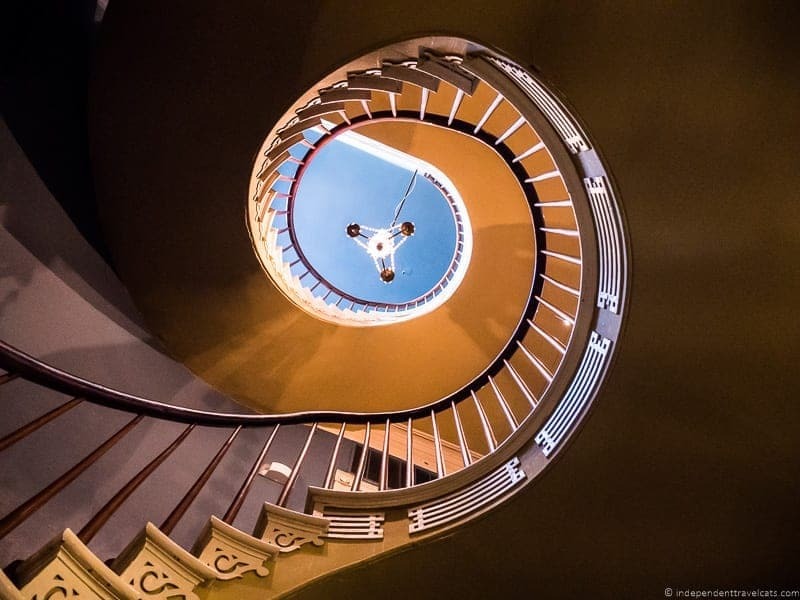 In 2015, Houmas House was voted #2 of top historic homes to tour in America by USA Today. The plantation is also a private residence and is known for being the setting for many scenes from Hush, Hush Sweet Charlotte starring Bette Davis. Owners: The plantation was originally bought by two New Orleans businessmen, Maurice Conway and Alexandre Latil, from the Houmas Indians. Latil built a modest house here which may be the existing smaller house. General Wade Hamilton from South Carolina was the next owner and his son-in-law, John Smith Preston, built the present Greek Revival mansion. It then went through a succession of owners, being purchased by Dr. George Croza in 1940 who restored the house. In 2003, it was purchased by current owner, dog-loving businessman Kevin Kelly, who actually still lives in the house. Tours/Tour Guides: The main house and kitchen can only be viewed on a guided tour, but the grounds and gardens are self-guided. Tour guides are costumed in antebellum clothing. Main House Furnishings: The house is furnished, some pieces are original but most are period pieces. 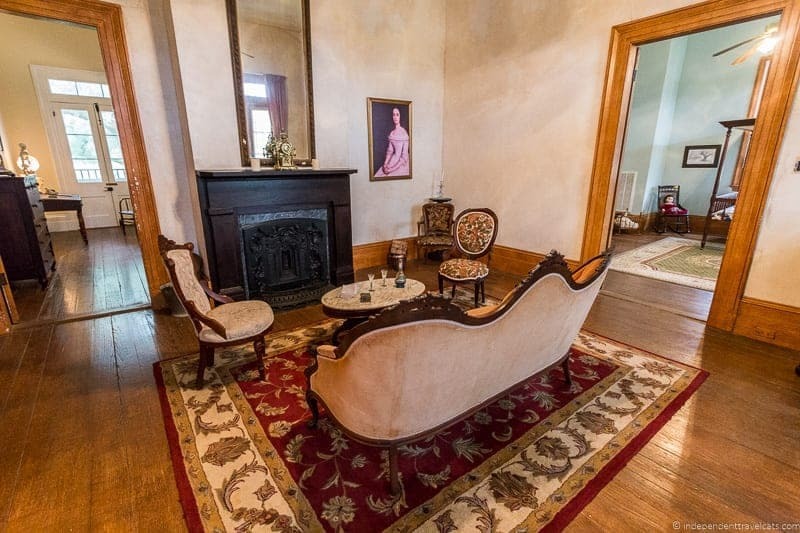 House is sumptuously furnished and has a lot of antiques. 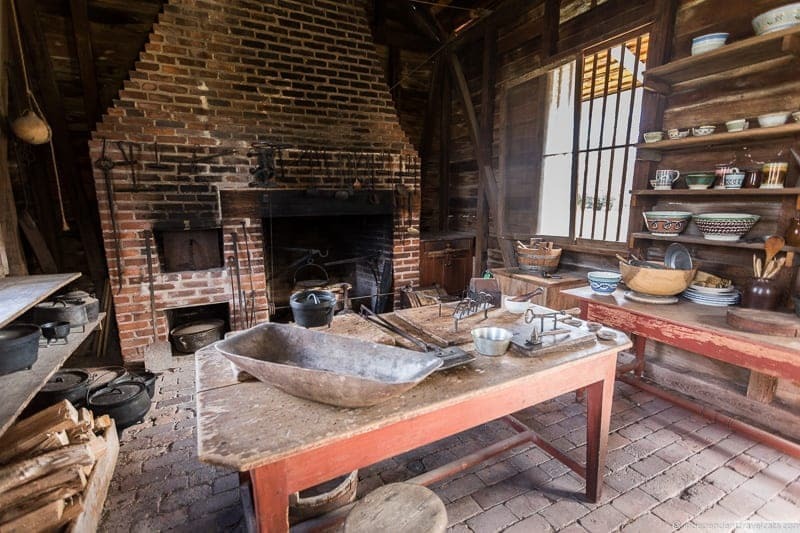 Other buildings to visit on property: The property also has the kitchen (visited on the tour) and two matching brick octagonal two-story garconnières (c. 1840s), although these were not open for viewing during our visit. Slavery Information: There was a small amount of information about slavery during the mansion tour. Gardens: Yes, almost 38 acres of gardens that include both indigenous Louisiana plants and exotic plants and flowers. There is the Hampton Garden, Upper Garden and Neptune Pavillion Fountain which surround the Fountain Courtyard. 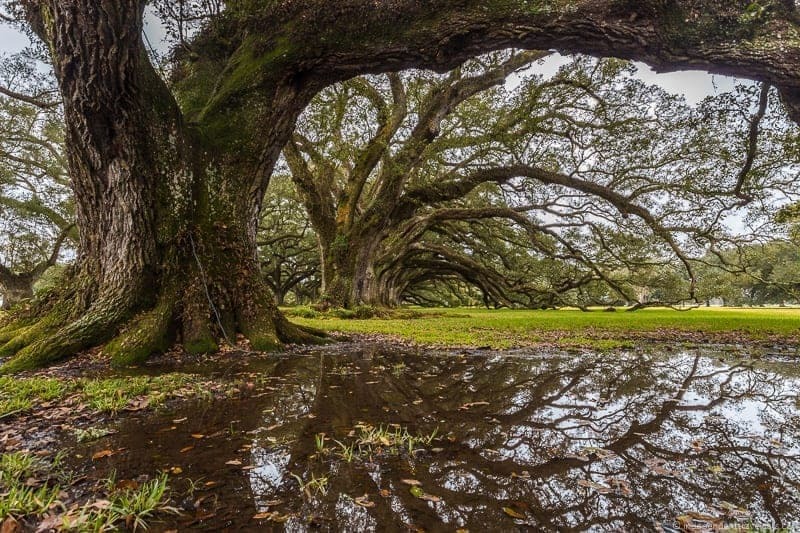 There are also eight 200-year-old grand live oak trees on the property, these were once part of a 24 oak tree oak alley leading all the way to the Mississippi river until most were cut down by the Works Progress Administration levee crew during the Great Depression. Photography Allowed: Photography is allowed outside and inside. Food: Yes, there is a cafe (Cafe Burnside) offering lunch, The Turtle Bar (located inside one of the garconnières) serving drinks, a restaurant (Carriage House Restaurant) serving breakfast, cocktails, and dinner, and a more formal restaurant serving dinner (Latil’s Landing Restaurant). Reservations are required for dinner. Accessibility: Houmas House is probably the most accessible of the River Road plantations. Although there are a number of stairs within the main house, the house has a ramp and elevator offering step-free access. The elevator can hold wheelchairs and most mobility scooters. The gift shop, cafe, and restaurant are wheelchair accessible and there are wheelchair accessible toilets available. Much of the grounds has sidewalks and drivers with golf carts are regularly available to take guests around the grounds. Houmas House also offers two ADA overnight rooms, one of which has a roll-in shower. 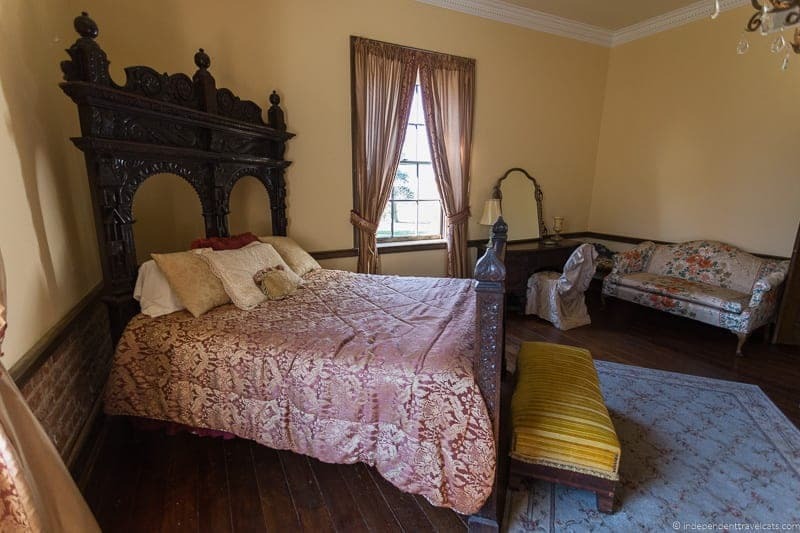 Days Tours Available from New Orleans: Yes, a few options are this tour (Houmas House only), this tour (Houmas House plus lunch and Madewood Plantation), and this private tour (also includes Destrehan Plantation). Lodging: Yes, there are 21 rooms and suites in modern cottages on the property. 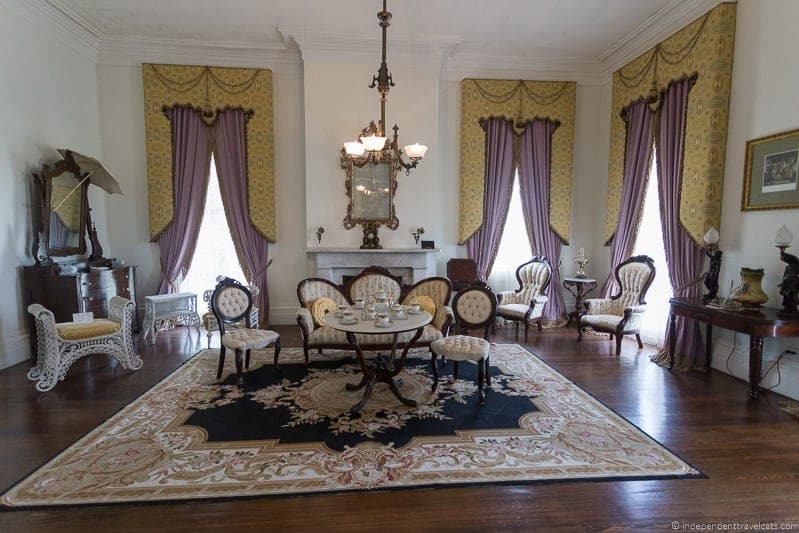 Breakfast and a tour of the Houmas House mansion are included with an overnight stay. Check prices here. Crowds: Medium to Large – This plantation was not that busy the day we visited, but it can get large crowds. It is well-known and popular. Most Unique: The flair and knowledge of the costumed guides (they really are good at acting like they are Southern antebellum ladies/gents), the sumptuous furnishings and antiques, tour is pet-friendly, and the extensive gardens. Houmas House is also well-known in the area for its food, especially the fine dining experience at Latil’s Landing Restaurant. 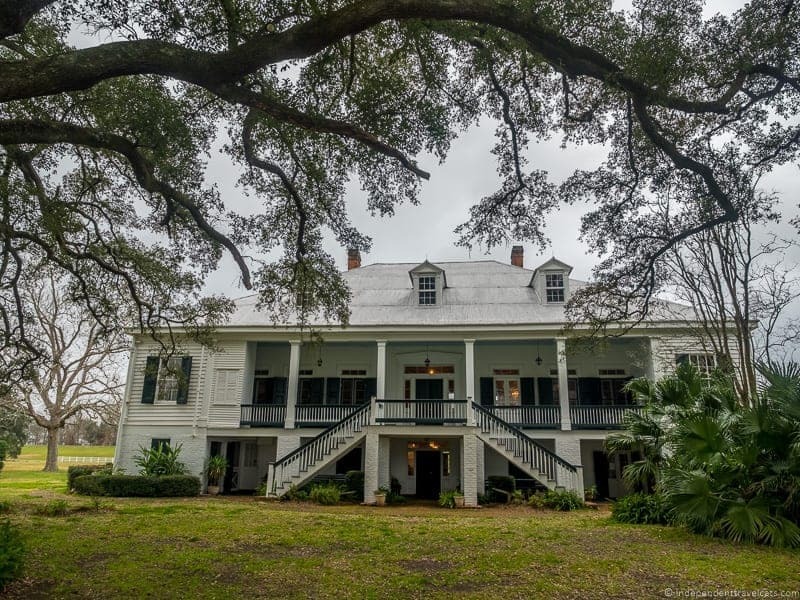 Houmas House Plantation is one of the most opulent of the Louisiana River Road plantation homes, beautifully restored and filled with elegant furnishings and antiques. 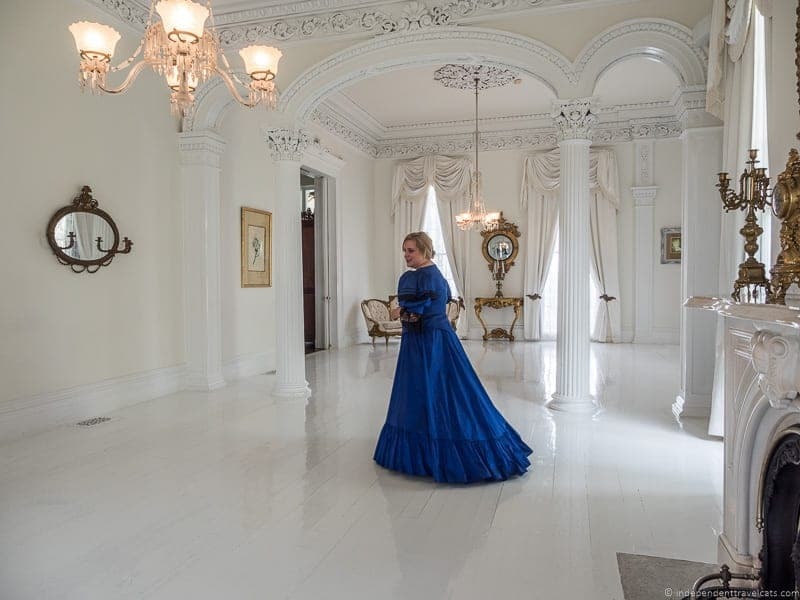 The costumed guides aim to take you back to the height of the antebellum period and show you what it would have been like to be part of a sugar baron’s family and live a lavish lifestyle. Our guide was not only entertaining, but also very knowledgeable about the house, history, and furnishings. The tour included visits to the main Greek Revival mansion and the smaller older house that contains the kitchen and restaurant. Some of the antiques are quite remarkable and you even get to see the owner’s bedroom (if he’s not in it) and you’re likely to see his dogs. This is a private residence as well as a house museum and you are allowed to touch many of the objects and even sit on the furniture, and since the owner loves dogs, well-behaved pets are allowed on the tour. Be sure to check out the short video in the gift shop before or after your tour and leave time to walk around the gardens and grounds. We were sad to not have time to dine here as dinner at Latil’s Landing Restaurant was highly recommended to us, even by staff at other plantations. 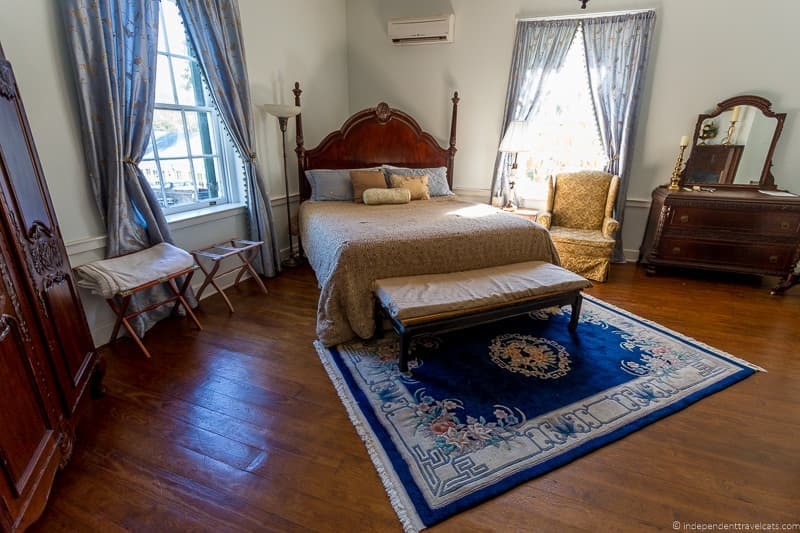 Houmas House is a great plantation for those looking to hear about what it was like to live as an owner of a wealthy sugar plantation, see elegant furnishings and antiques, and stroll through beautiful gardens. However, this is not going to be a good fit for those looking for slavery information or those looking for a more intact plantation complex with lots of historical buildings to visit. However, it was one of the most entertaining house tours we took and the best plantation to visit if you are looking for gardens or a pet-friendly house tour! Poché Plantation is the youngest of the Louisiana River Road plantations we visited, and the existing main house was actually built after the Civil War in 1867. The house is unique for its architectural style, Victorian Renaissance, and is also significant for its association with its original owner, Judge Felix Pierre Poché. In addition to being a founding member of the American Bar Association, Poché is also known for keeping a diary in French detailing the Civil War in Louisiana. It is one of only a handful of existing printed accounts of the Civil War as a Confederate in Louisiana. However, perhaps the most unique thing about Poché Plantation is that it is also a motor coach RV park (as well as a B&B). This is an ideal spot for those exploring the Louisiana River Road in a campervan or RV! Tours/Tour Guides: Main house can be visited with a guided tour, please call ahead for tour times. There is also a small museum focused on post-Civil War local history. Tours are typically given by the owner. Main House Furnishings: The house includes some original furnishings and some period specific pieces. Other buildings to visit on property: The other historical building on the property is the Judge’s Office which is a 4-room building built in 1830 which may or may not be open during your visit. St. Michael the Archangel Catholic Church is just a short 5-minute walk from the plantation. Slavery Information: You won’t likely find a great deal of information about slavery here. The current plantation home was built after the end of slavery. Judge Felix Pierre Poché came from a planter family, but spent his life working as a lawyer, judge, and politician. Gardens: Extensive grounds but no formal garden. Photography Allowed: Photography is allowed inside and outside. Food: No, but picnic area and group kitchen facility available on site for campers. Accessibility: The main house at Poché Plantation is not wheelchair accessible. Some of the RV park amenities are wheelchair accessible including the shower rooms, and at least one of the overnight cottages is wheelchair accessible. Lodging: Yes, Poché Plantation is a RV park and also rents bed-and-breakfast rooms and cottages. The RV park is a full-service site designed to accommodate about any type of modern RV, campervan, or fifth wheel home with large concrete spaces, tower hook ups, WIFI, showers, coin laundry, hot tub, and a swimming pool. Crowds: Low. The RV park is popular, but typically visitor numbers for house tours are low compared to nearby plantations. Most Unique: The architecture style and being the only plantation that allows RV overnight stays (state’s only destination RV resort). The youngest property open for tours in the area. Poché Plantation is a bit of a surprise for most visitors as a RV park and a plantation house are not normally located side by side. We did not actually tour Poché Plantation as we arrived just after the daily tour times, but we did walk around the property a bit in our search to see if tours were still available. We recommend calling or emailing ahead for those wanting to tour the plantation house. 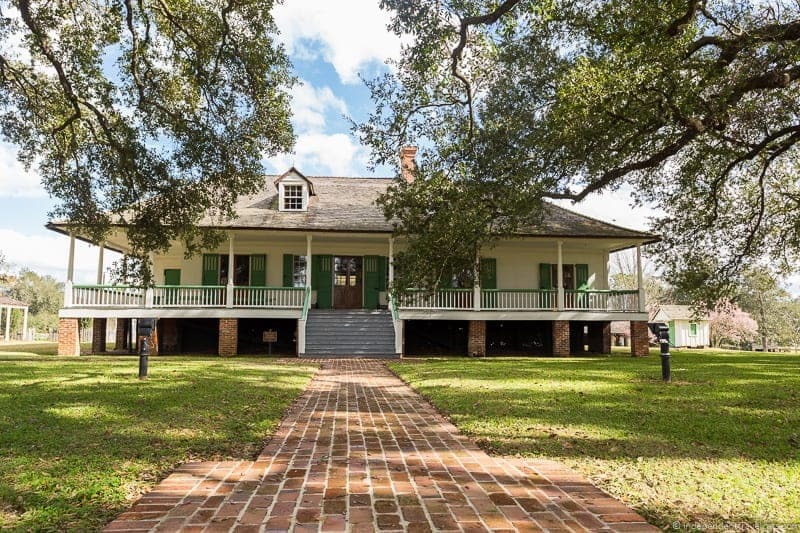 This house is probably not likely going to wow those looking for a grand plantation house or those searching for historical information about plantation life, slavery, and/or life in antebellum Louisiana. However, the architecture is unique and the story of Judge Felix Pierre Poché and his family is quite interesting. A couple of rooms in the main house (as well as guest cottages) can also be rented out for those looking for a plantation house stay. 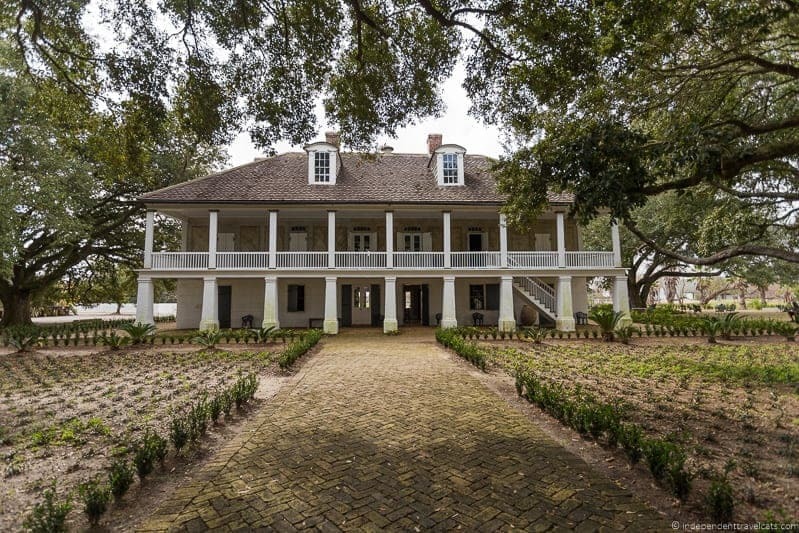 RVers wanting to explore the Louisiana plantation homes should definitely check this place out. Oak Alley Plantation is often referred to as the Grand Dame of the Great River Road with its lovely Greek Revival style mansion and famous 300-year-old alley of oaks. It is certainly one of the most photogenic and has been featured in several films, including Hush Hush Sweet Charlotte, Primary Colors, and Interview with the Vampire. Guests also have the option to eat, shop, and/or stay overnight at this plantation. However, the beauty and amenities here come at the price of being one of the most visited plantations in Louisiana and it can get quite crowded. Despite potential crowds, it can be a hard plantation to resist, and you can read our full Oak Alley review. Owners: Jacques Télesphore Roman built the Oak Alley mansion as a gift for his wife Celina. The Roman family would run the sugar cane plantation until 1866 when it was sold to a long succession of owners, slowly falling into disrepair. The house would be restored in the 1920’s by Texan cattle ranchers Andrew and Josephine Stewart. Today, the Oak Alley Foundation, set up by Josephine Stewart, runs the plantation. Tours/Tour Guides: The main house can only be visited with a guided tour, but the outdoor exhibits, gardens, and other buildings are self-guided. Tour guides are costumed in antebellum dress. Main House Furnishings: The house is sumptuously furnished. Only a few pieces are original, but most are period consistent items from the mid-1800’s. Other buildings to visit on property: The property also contains 6 reconstructed slave cabins which contain a slavery exhibit, an Overseer’s Property (original building, private), sugar kettles, old plantation bell, Roman family tombstone, and a blacksmith shop that includes a 1890’s forge (demonstrations are sometimes done here). There is also a Sugar Cane exhibit and an interactive Civil War exhibit. Slavery Information: There is a small amount of information on slavery on the main tour. There is quite a bit of additional information available about slavery at Oak Alley in the self-guided slavery exhibit housed in the 6 slave cabins that were built using period consistent techniques and materials. Gardens: There is an English garden and small flower gardens. There are two oak alleys, one in the front of the house and one in the back. 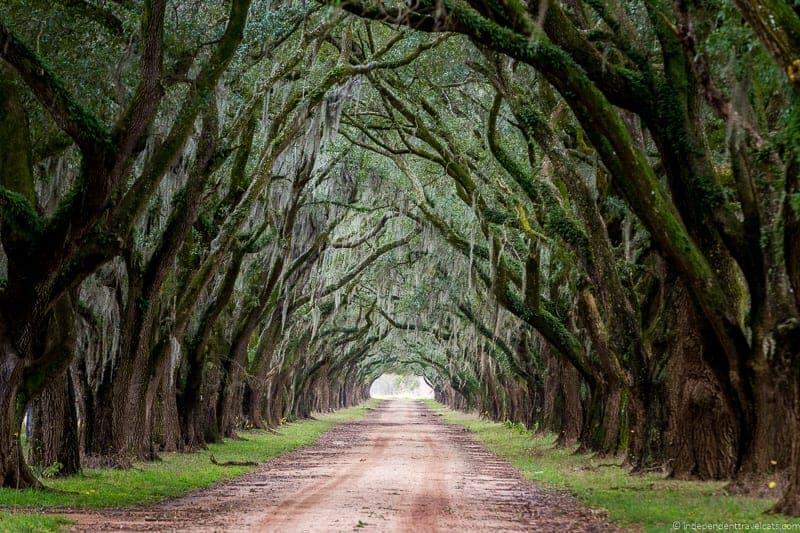 The famous Alley of Oaks is a 800-feet-long alley of 300-year-old mature Virginia Live Oaks located on what would have been the front of the house. An alley of younger oaks in the back alley were planted in the 1830’s and 1930’s. Food: Yes, there is both a sit-down restaurant and a cafe at Oak Alley. There is also a Spirits Bar located across from the restaurant. There are also some picnic tables located near the parking lot. Accessibility: The Oak Alley Plantation main house has step-free access (with a movable ramp that can be placed over the 1 step) into the ground floor but the second floor is not wheelchair accessible. There are 22 steps to reach the second floor of the house. Guests who cannot climb the steps will be led by the guide to the media room to watch the tour on an individual iPad after seeing the ground floor. There are 3 steps up to access slave cabins. There are wheelchair accessible toilets in the Oak Alley restaurant. There are disable parking spaces near the restaurant which visitors should ask about at the booth upon arrival. The gift shop, restaurant, and outside paths are accessible (made of concrete or brick). One of the overnight cottages is wheelchair accessible. Days Tours Available from New Orleans: Yes, there are several options including this tour (Oak Alley only), this tour (also includes Laura Plantation), this tour (choice of 2 plantations), this well-rated full day tour (also includes Laura Plantation, lunch, and swamp tour), and this private tour (Oak Alley only). Lodging: Yes, there are currently 8 guest cottages on the property; some are historical plantation cottages, some are newly constructed modern deluxe cottages. Read about our Oak Alley Plantation visit and overnight stay. Crowds: Large – this is one of the most visited plantations in the area and crowds can be very large at times. Most Unique: The oak alley and the grandeur of the house and its furnishings. 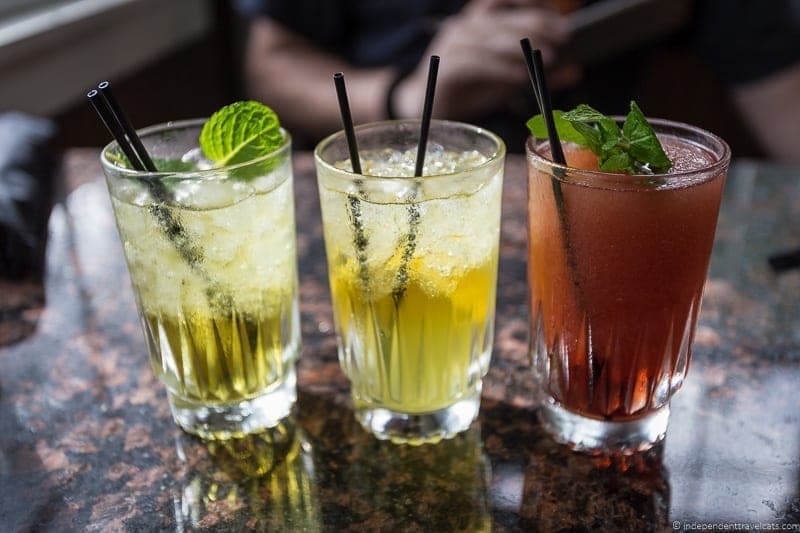 It is also known for its restaurant’s Creole and Cajun dishes and its mint juleps. Oak Alley is a crowd pleaser with its beautiful Greek Revival mansion, dreamy alley of stately live oaks, and sumptuous furnishings. The plantation is lively, busy, and has dining and lodging opportunities. It is popular and crowds can be large here, so try to visit in the early morning or late afternoon if you can. Oak Alley can be visited for free with a New Orleans Pass, so we strongly recommend visiting here for pass holders. The house tour focuses on the lives of the first owners (Romans) and last owners (Stewarts), antebellum life in the house, and the decline and restoration of the house. The house seems smaller inside than it does from the outside. Towards the end of the house tour, you get a nice view of the oak alley from the verandah. Interesting tidbits from the tour that stuck with me was the mystery of why there is no Spanish moss on the live oak trees, the use of the courting candle, and that the plantations enslaved gardener Antoine was the first person to successfully graft pecan trees and his work resulted in the first named variety. Be sure to spend time at the Slavery Exhibit; we do wish a guide-led tour focused on slavery was also offered here at Oak Alley for those wishing to know more on the topic. Our overnight stay at Oak Alley was a wonderful experience with a nicely furnished modern cottage and the privilege to stroll the grounds peacefully after all the visitors were gone. We ate three meals at Oak Alley, including dinner in our room, and we really enjoyed all the dishes we tried and we also enjoyed sipping on mint juleps (three types to choose from!) while walking around the grounds. Oak Alley Plantation is a great fit for those travelers seeking a grand richly furnished plantation house and photogenic views. The view of Oak Alley Plantation house from the oak alley may be the best view on the entire River Road. St. Joseph Plantation is a working 1,000 acre sugar cane farm that has been owned by the same family since 1877. Family members still manage the property and even lead many of the house tours. 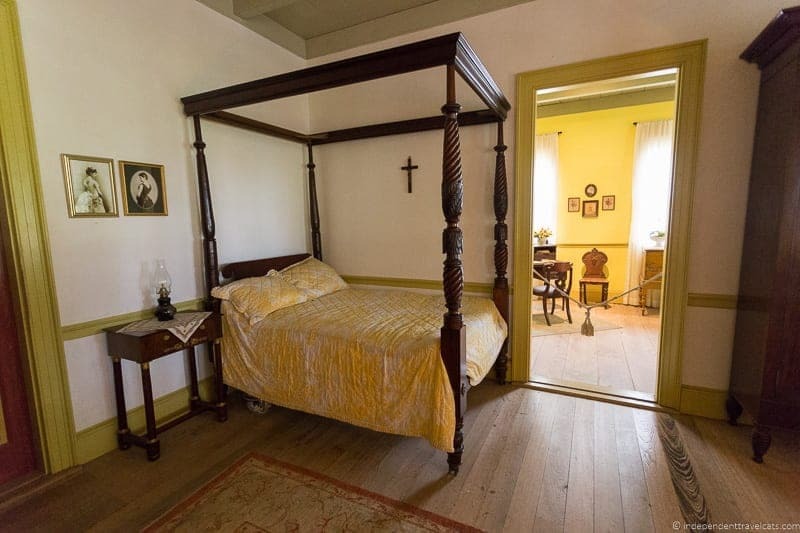 St. Joseph is described as “authentic”, and plantation house tours focus on the lives of those who lived at the plantation with a special focus on Creole culture and the Reconstruction period. St. Joseph Plantation (when a part of it was known as Priestley Plantation) is also the birthplace of Henry Hobson Richardson, a prominent 19th American architect, probably best known for designing Trinity Church in Boston. 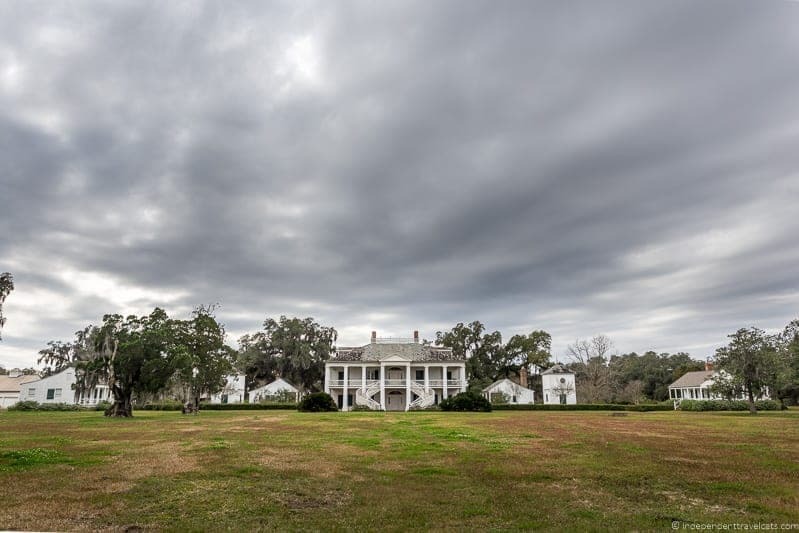 The family also owns the adjacent Felicity Plantation, which is not open to the public but is regularly used for filming, including 12 Years a Slave, The Skeleton Key, Oprah’s Queen Sugar, Underground series, and the 2016 remake of Roots mini-series. 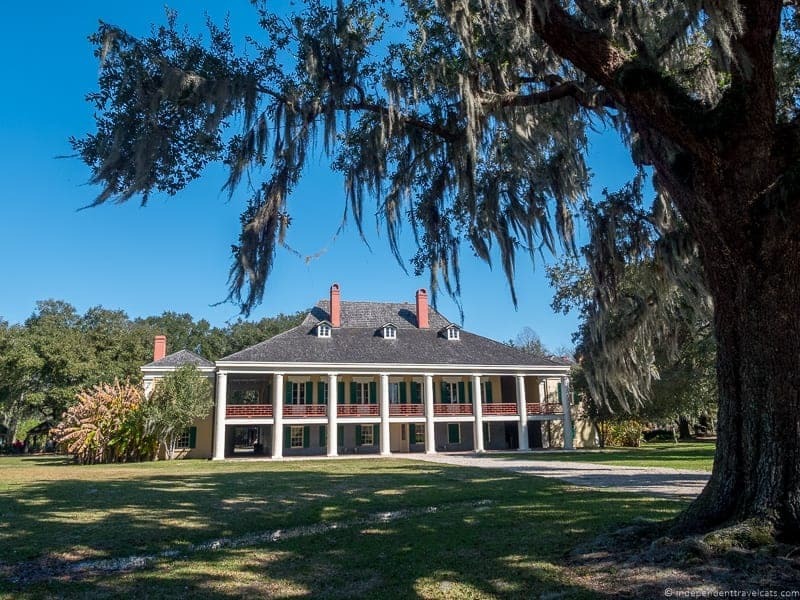 Owners: St. Joseph Plantation was built by the Louis Scioneaux family, then sold to a French doctor Dr. Cazamine Mericq and then to Alexis Ferry and his wife Josephine (daughter of the immensely wealthy sugar planter François-Gabriel “Valcour” Aimé). 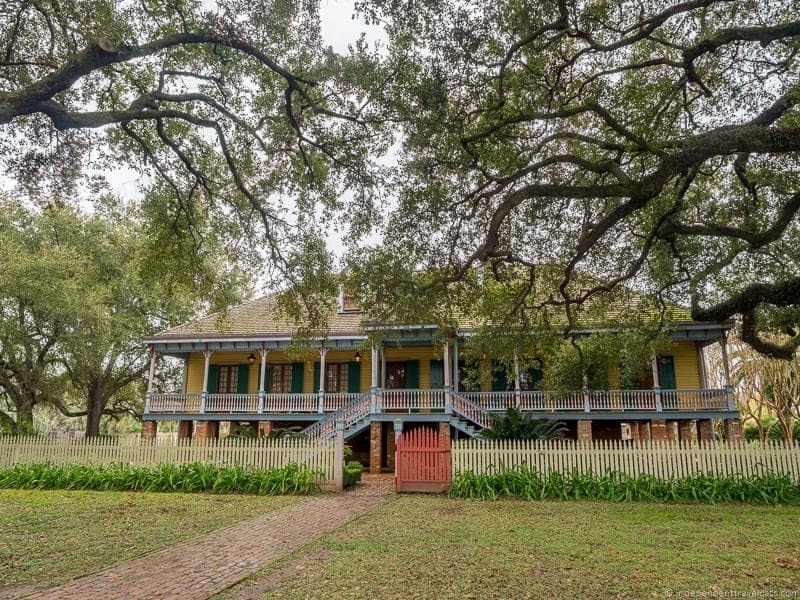 In 1877, the house was purchased in a sheriff’s sale by Joseph Waguespack who named it St. Joseph Plantation and it is still owned by descendants of the Waguespack family today. About 200 Waguespack and Simon family members currently own stock in the family-run sugar cane plantation. Tours/Tour Guides: Main house can only be visited with a guided tour, but the other buildings are self-guided. Special themed tours, such as a Creole Mourning tour, are sometimes offered. Tour guides are not costumed. Main House Furnishings: Rooms are furnished and many of the objects are original to the house and/or family. Many of the pieces are Reconstruction era (post-Civil War period). 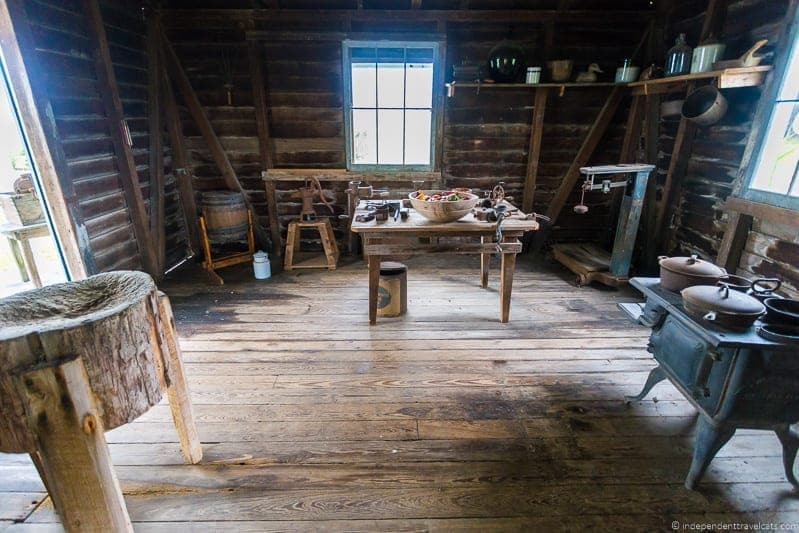 Other buildings to visit on property: The property also contains original slave cabins (c. 1830-1840), detached kitchen (c. 1880’s), blacksmith’s shop, carpenter’s shed, and a small schoolhouse. Some buildings have been moved closer to the house but most remain where they were built. There is also a short video on sugar cane production that you can watch. There is also a former plantation store on the property (currently a flower store), that was the longest opened store on the River Road, only closing in the 1990’s! The family also owns the next door Felicity Plantation house, built in 1850, which is currently not open to visitors but is often used for filming. Slavery Information: There is a small amount of information about slavery on the main tour. There are original slave quarters buildings on the property for viewing. Gardens: No gardens, but there are small pretty flower beds and a number of trees on the property, including some grand 300 -year-old live oak trees on the property. Food: No, but picnic tables under the oak trees are available for use by visitors who bring a picnic lunch. 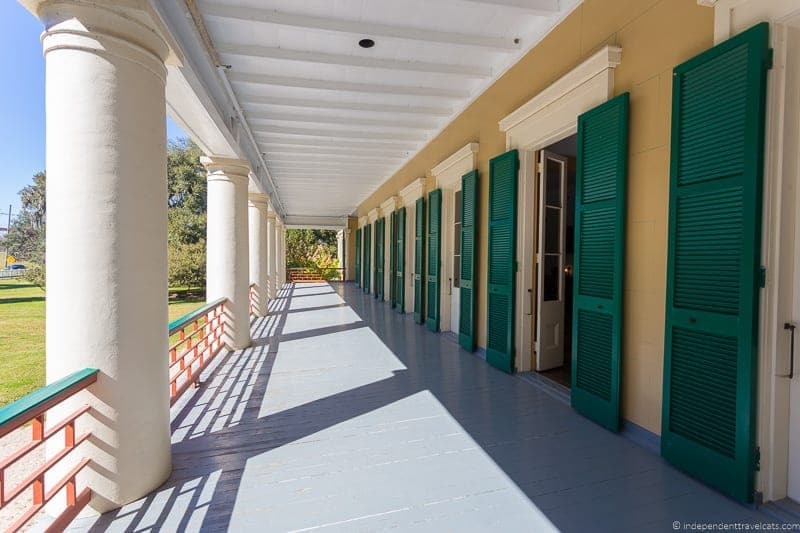 Accessibility: Only the first floor of St. Joseph Plantation has step-free access and is accessible for wheelchairs. There is no step-free access to the second floor which includes a large portion of the tour rooms. The film room, farm tools, and gift shop are on the first floor and are wheelchair accessible. Days Tours Available from New Orleans: Yes, this tour includes a visit to St. Joseph Plantation and Whitney Plantation. You could also arrange a private tour. Crowds: Small – this is not typically a busy property and is not very well-known in comparison to many of the other plantations. Most Unique: Working family-owned sugar cane plantation, focus on Creole customs, owned and run by family (most guides are family), and authentic furnishings. St. Joseph is a family-run working sugar cane plantation that feels more authentic than most of the other properties. The house is not nearly as grand as its finely furnished restored next door neighbors Oak Alley or Houmas House, but the lack of heavy restoration helps add to the experience here. We also enjoyed that we were able to touch many of the pieces of furniture/artifacts in the house; Laurence even had a go at the pump organ. It was one of my favorite visits as it felt less commercialized than some of the others and it does not get the crowds of some of its better-known neighbors. The main house was lived in until 1997 and the guides are able to give you plenty of interesting details about family life here following the Civil War. There is of course also information about the antebellum period and Civil War history of the house and inhabitants, but what is more interesting here is hearing from the family of life following the Civil War. Many of the former slaves stayed on as tenant farmers and some of their descendants continued to live on the plantation for generations. Tenant farming, especially in the 19th and early 20th century, was still a tough life and tenants lives were heavily dependent on the weather, crop conditions, and the goodwill of plantation owners. The descendants of Joseph Waguespack have continued to run the farm through good and bad times. The tour guides and gift shop staff are normally family members. It is interesting to hear stories of those who remember growing up or visiting the plantation and to see items such as the christening gowns worn by generations of family members (including some of the guides). Don’t forget to leave some time to explore the outside buildings (e.g., slave cabins, kitchen) on your own (pick up a leaflet for some information on the buildings). If it is a nice day, consider picking up some food from a local grocery store or deli and eating under one of the oak trees here. This is a great bet for those looking to visit a family-owned working plantation and those wanting to hear a bit more about what happened on plantations after the Civil War! 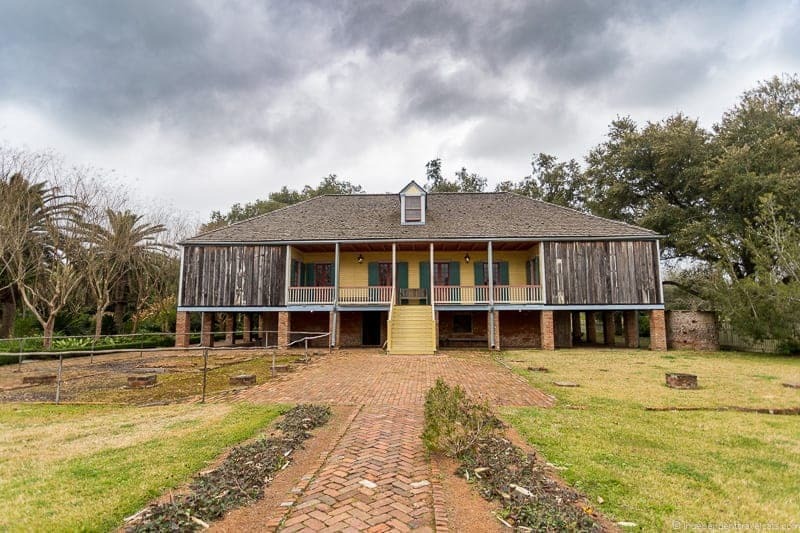 Laura Plantation is a French creole plantation that is known for being run by four generations of the Duparc-Locoul family, with the women of the family being primarily responsible for running the plantation. The last owner from the family, Laura Locoul, would sell the plantation and later in her life write a memoir, Memories of the Old Plantation Home: A Creole Family Album, focused on her time growing up and running the plantation. It is now this memoir that provides the main material for the guided house tours at Laura Plantation. Laura Plantation is also known for being one of the locations where folklorist Alcée Fortier (born at Petit Versailles Plantation) recorded the African stories of the trickster Br’er Rabbit from the slaves (known as Compair Lapin in French Creole). In 2004, the plantation house suffered extensive damage due to a fire (now restored), but numerous original outbuildings from the antebellum period survive on the property. Owners: This house was built by Frenchman Guillaume Duparc and was then passed onto 4 generations of his family who worked and live on the plantation, ending with Laura Locoul who sold the plantation in 1891. The plantation was then sold to the Waguespack family (owners of St. Joseph Plantation) who farmed the sugarcane and lived at the plantation until 1984. It is currently owned and run by the Laura Plantation Company as a Creole cultural attraction. Tours/Tour Guides: Main house and grounds can only be visited with a guided tour; guided tour includes main house, slave cabins (c. 1840), gardens, and a view of some of the other buildings (barns, overseer’s cottage). Tours are available daily in both English and French. Tour guides are not costumed. Main House Furnishings: The house is furnished but the furnishings are not original, but are era specific. Other buildings to visit on property: The property also contains a number of other buildings, including slave cabins, barns, overseers’ cottages, and the Maison de Reprise (1829; mother-in-law house). You can’t visit these building on your own but on the guided tour you get to go inside a couple of the slave cabins and get exterior views of some of the other buildings. Slavery Information: Moderate. There is a substantive amount of information provided about slavery, life of slaves on the plantation, and part of the tour takes place in the slave cabins. Gardens: Yes, there is a small formal French garden, a kitchen garden, and a banana tree grove. Photography Allowed: Photography was allowed outside and inside. Food: No restaurant, but snack food and drinks were available in the gift store. Accessibility: The basement of the main house of Laura Plantation is at ground level and is step-free; however, there are 15 steps up/down into the main floor of the house. There are 3 steps up/down into the slave cabin. The house can accommodate a wheelchair or walker (although not a scooter) if visitor has a companion who can assist them up the stairs and carry the wheelchair. The gift shop and museum are wheelchair accessible but the 1840’s slave cabin is not. There is a wheelchair accessible toilet on site. Paths through the grounds are graveled or bricked. 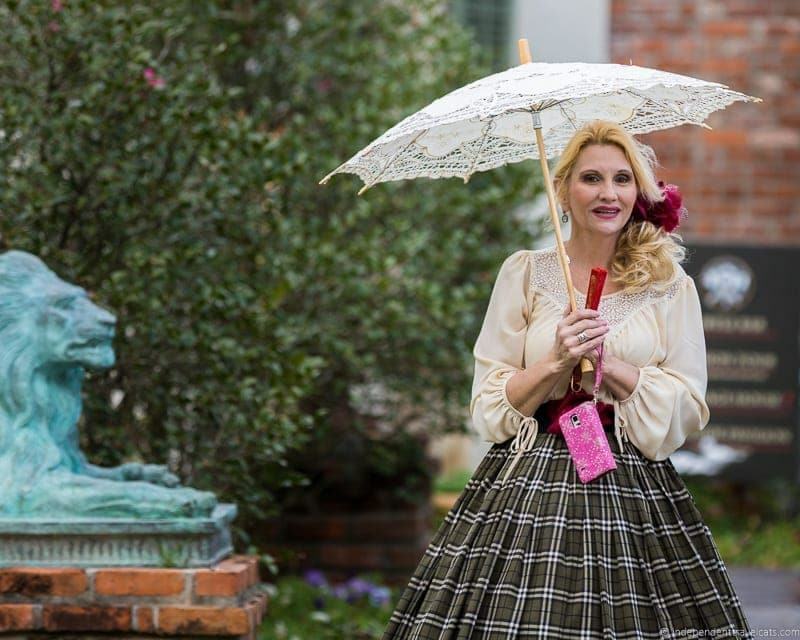 Days Tours Available from New Orleans: Yes, there are several tours options, including this tour (Laura only), this tour (also includes Oak Alley Plantation), this tour (also includes choice of Whitney Plantation or Oak Alley), this full day tour (also includes Oak Alley, brunch, and swamp tour), and this private tour (Laura only). Crowds: Moderate to Large – This is a popular plantation and can get quite busy. 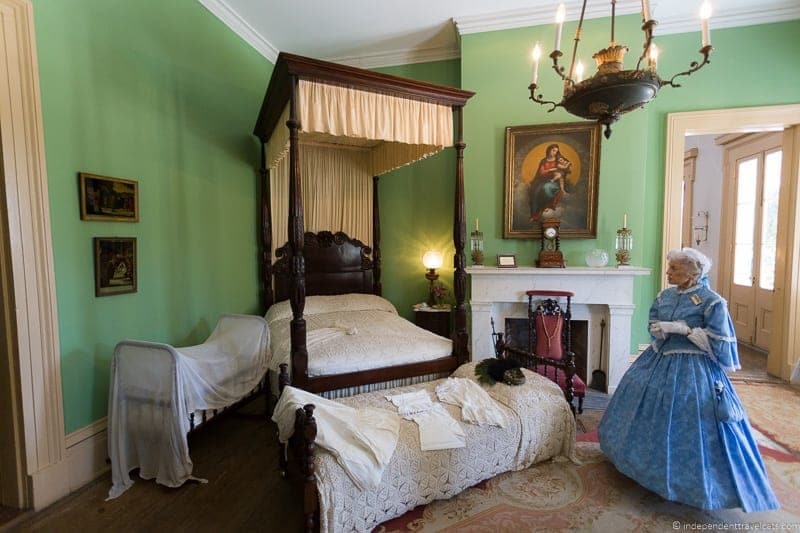 Most Unique: The focus on the lives of Laura and her family, emphasis on Creole culture, connection to the Br’er Rabbit tales, tours provided daily in French, and a moderate amount of information on slavery. Laura Plantation is a popular plantation and the tour focus on the story of Laura Locoul and her ancestors make it unique from the other plantations. In the past, plantation tours focused on the house and the Br’er Rabbit connection, but today the focus here is very much on the four generations of the Duparc family, particularly the women who all heavily contributed to the running of this plantation. I would recommend reading the actual book the tour is based on either before or after your tour. Laura grew up in a strict French-speaking Creole family and did not want to run the family plantation but did her duty running it for a while before deciding to marry a non-Catholic man, sell the plantation, and move to St. Louis. Late in her life she would write her memoir after a return visit to the plantation and questions from her children about her life on the plantation. The tour also focused on Creole culture and the lives of the slaves at the plantations, and we liked that part of the tour took part in the slave cabins with a focus on the lives of some of the known slaves. These cabins were actually lived in until 1977, first by former slaves and their descendants and then by lumber company workers. We also appreciated the colorful facade of the Creole main house; however, the majority of the house is not original and so there is not very much focus on either the house or the interior furnishings on the tour. So this would not be a great fit for those looking to learn a lot about the house, the furnishings, or general plantation life. This tour is a great fit for those wanting to learn about a Creole family and its story of running a plantation across multiple generations. It also has quite a bit of information on both Creole culture and the lives of slaves at Laura. Also, this a great place for anyone wanting a tour in French as it is the only plantation that we know of that regularly gives daily tours in French. Whitney Plantation is the only plantation in Louisiana to focus on the story of slavery. In fact, it is credited as the first (and currently only) museum dedicated to slavery in the United States. Tours here focus on slavery and try to communicate the harsh realities of slave life on a Louisiana plantation. It was the practice of slavery that made the great wealth of the plantation owners possible, and it was forced slave labor that harvested the fields and built the majority of these beautiful homes. 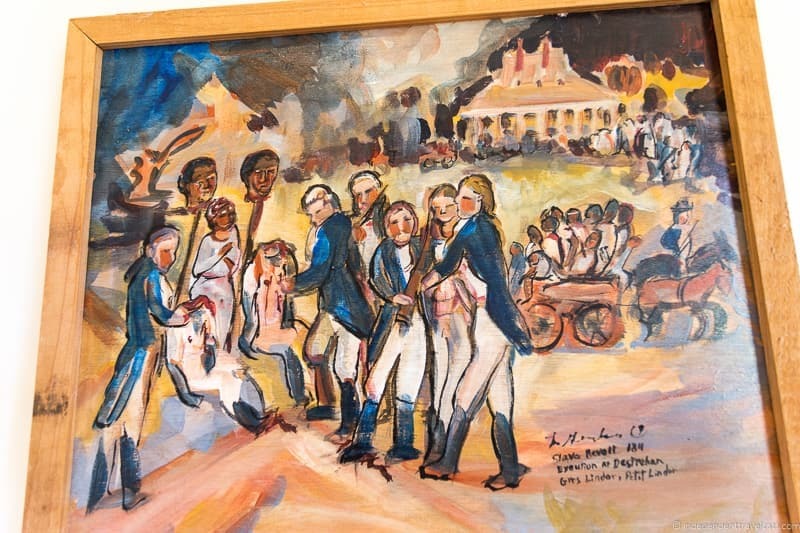 The plantation includes artwork dedicated to slavery as well as three memorials: one dedicated to the slaves at Whitney, one dedicated to the slaves of Louisiana, and another to slave children. Much of the information used in the tour, including many of the quotes, come from the Slave Narratives Collection that was part of the Federal Writers Project where former slaves (mostly children and young adults at the time of slavery) were interviewed between 1936-1938 across 17 states and most of these interviews are available online and in print in the Whitney Plantation gift shop. Significant historical buildings on the property including the Spanish Creole main house with original painted murals, the only French Creole barn in the United States, and the oldest detached kitchen in Louisiana. The plantation is also known for being the setting of some scenes from Quentin Tarantino’s Django Unchained. Owners: The plantation, originally known as Habitation Haydel, was first owned by Ambroise Heidel, an immigrant from Germany who purchased it in 1752. The main house is believed to have been built by his son Jean Jacques Haydel. It was sold to a succession of owners over the years. The plantation gets its current name from owner Bradish Johnson (who purchased it in 1867) who named it after his grandson Harry Whitney. Today, it belongs to John Cummings, an attorney from New Orleans, who was the person who decided to open it for the first time to the public and to dedicate it to understanding the facts of slavery. Tours/Tour Guides: Whitney Plantation can only be visited on a guided tour. Tour guides are not costumed. Main House Furnishings: The house is furnished but the pieces are not original, but they are period furnishings from the early 19th century. Other buildings to visit on property: The property also contains a number of other historical buildings on the plantation, many of them original, including a pigeonnier (c. 1820, the other one is a reconstruction), mule barn, overseer’s house, detached kitchen (c. 1790), French Creole barn, blacksmith shop (rebuilt in 2005 to original design), and slave quarters cabins (original cabins brought from other nearby plantations), and a baptist church (moved here from Paulina, LA). Other buildings and memorials are relatively new and have been constructed to house the slavery museum and exhibits. 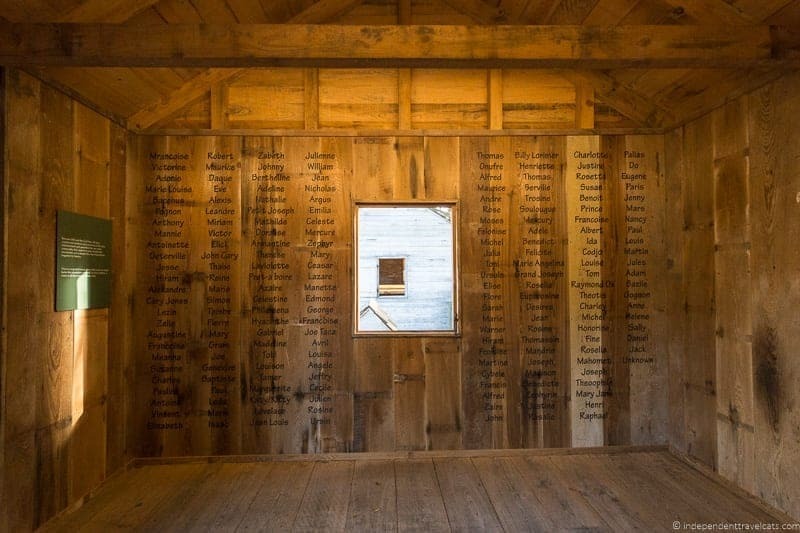 The memorials include the Wall of Honor (Whitney slave memorial), Allées Gwendolyn Midlo Hall (memorial to slaves in Louisiana) and The Field of Angels (slave memorial to Louisiana slave children). Slavery Information: Large. 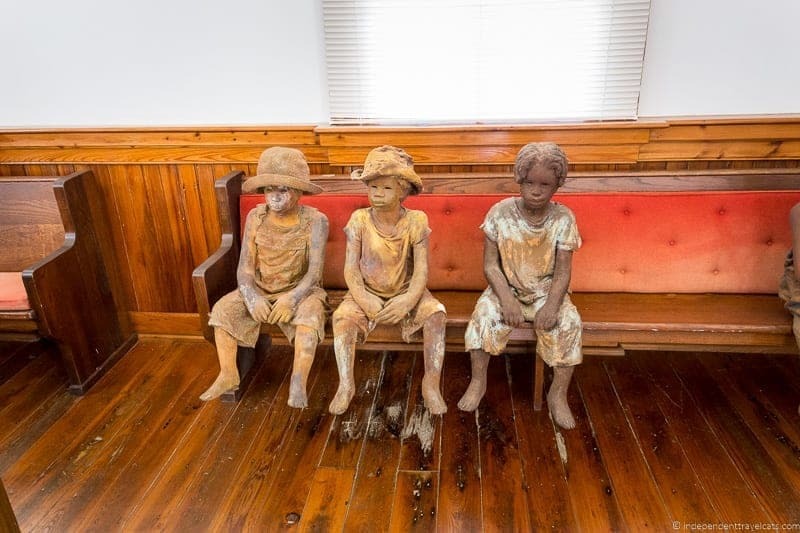 This is the only plantation, and only museum in the country, currently solely dedicated to sharing information about slavery and stories of former slaves. There are several memorials, artwork, and original slave quarters on the property to view. There is also a large number of books in the gift shop on the subject of slavery. Gardens: No, but there are some great old live oaks in front of the main house. Food: No, but there is a vending machine with snack food and drinks at the visitor center. Accessibility: The majority of the guided tour at Whitney Plantation is accessible for mobility scooters and wheelchairs, as most takes place outside. The visitor center, gift shop, church with introduction video, memorial area, and bottom floor of the Big House have step-free access and are wheelchair accessible. The second floor of Big House has 10 steps and is not wheelchair accessible. There are 2 steps each to get in and out of slave cabins and kitchen. Outside paths are mostly made of tight gravel. Tour is 1.5 hours long so may not be a good fit for those who have difficulty standing for longer periods of time although you can bring a walker, cane, or collapsible chair with you. The visitor and information center has a wheelchair accessible toilet, and there are 4 disabled parking spaces. 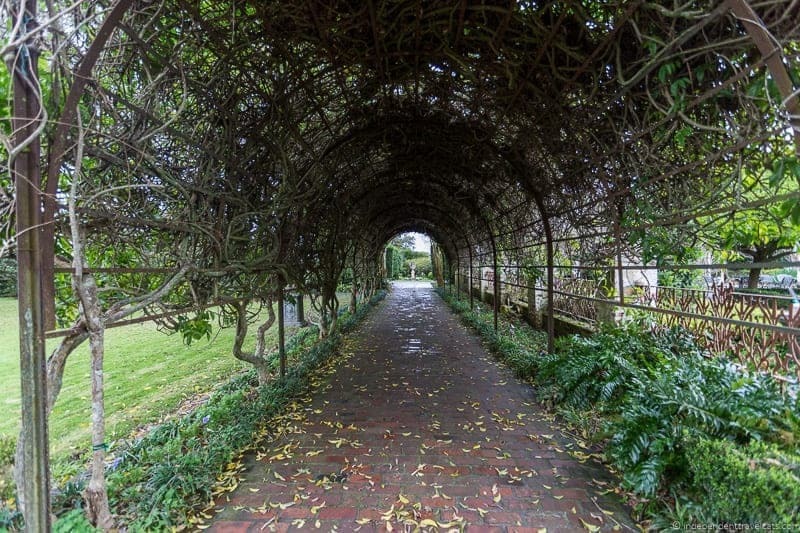 Days Tours Available from New Orleans: Yes, there are several tours options, including this tour (Whitney only), this tour (also includes choice of Laura Plantation or Oak Alley), and this tour (also includes St. Joseph Plantation). Crowds: Moderate – opened in 2014 this is becoming a more popular plantation as it becomes more well-known to the public. 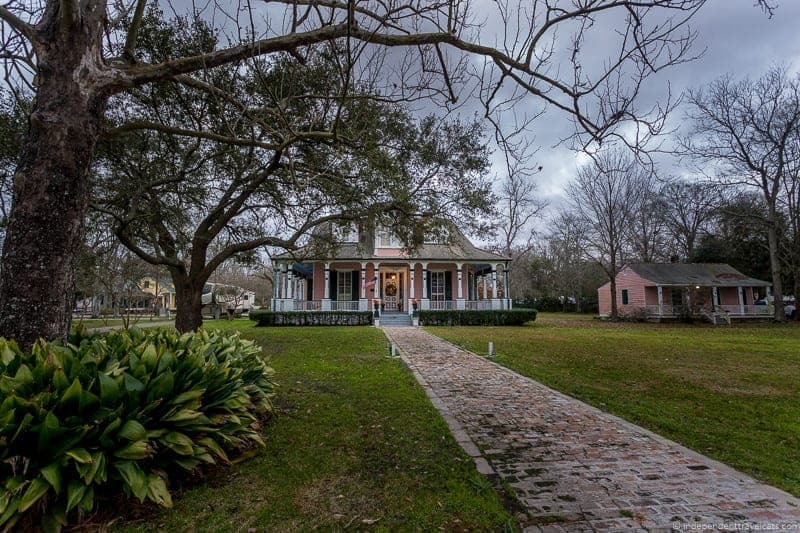 Most Unique: The focus on slavery, slavery memorials, Spanish Creole architecture of main house and its decorative wall paintings, oldest detached kitchen in Louisiana, and last known surviving French Creole barn in the United States. 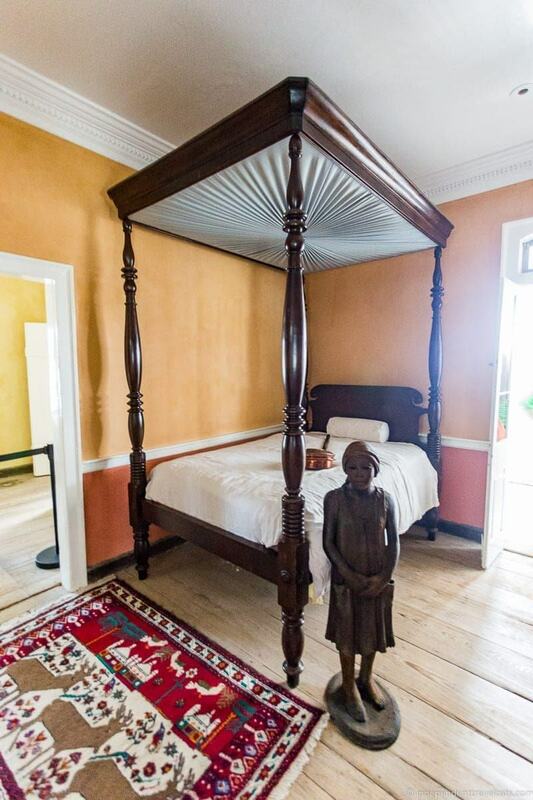 Whitney Plantation is the only plantation museum in Louisiana dedicated to slavery, and the tour is strongly focused on providing factual information about slavery as well as stories from former slaves. First, we checked out the small museum at the Visitor Center where there is some good information on slavery around the world–I was quite surprised about the Catholic church’s role in both encouraging and later ending slavery, Portugal’s large role in the slave trade, and the large number of slaves brought to Brazil. Our tour started with a visit to the church where we watched a good introduction film and the we were each given a card with information about a former slave. 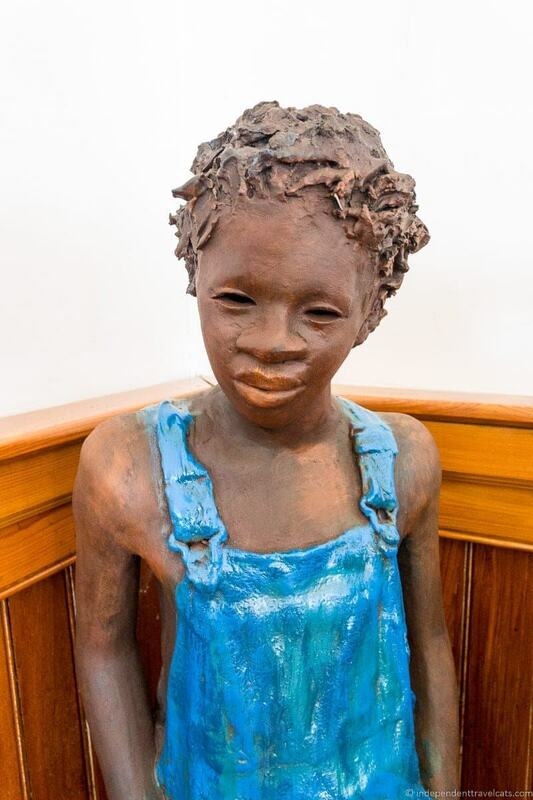 There are 40 excellent slave children statues made by artist Woodrow Nash and you can locate the one made to represent the slave you are given; these really help to made a more personal connection. After this, we were taken outside and given some more information and taken through 3 slavery memorials (the bronze sculpture depicting a crying angel carrying a slave baby to Heaven is quite evocative) which was about 2/3 of the tour. There was some great information here, including some truly heart wrenching stories, but we would have liked to have just been introduced to the memorials and left to explore the memorials on our own rather than exploring them on a time limit as a group. The final part of the tour was exploring the buildings, which included slave cabins, an iron jail, the kitchen, blacksmith’s shop, and the master’s main house. There was some great information on the jobs and work of some of the slaves. The main house tour is quite quick as it is not the focus of the tour but the house is significant for its age, architecture, and the painted murals on the interior and exterior of the house which are original and quite rare. Be sure to leave a bit of time to browse the gift shop, which has a particularly large collection of books related to slavery. Whitney Plantation is obviously not a place for those wanting to focus on the tales of the wealthy owners, sumptuous house furnishings, or a detailed information about the plantation buildings themselves, as the focus here is primarily on slavery and the memorials. It should also be noted that the majority of the 1.5 hour tour takes place outdoors and involves quite a bit of walking so plan accordingly. However, for anyone wanting to truly learn the harsh facts about slavery, especially slavery in Louisiana and the American South, they should definitely pay a visit to Whitney Plantation. The story of plantation life is not complete without the history of slavery. Evergreen Plantation is one of the largest and most intact plantation complexes in the South with 37 buildings on the National Register of Historic Places. 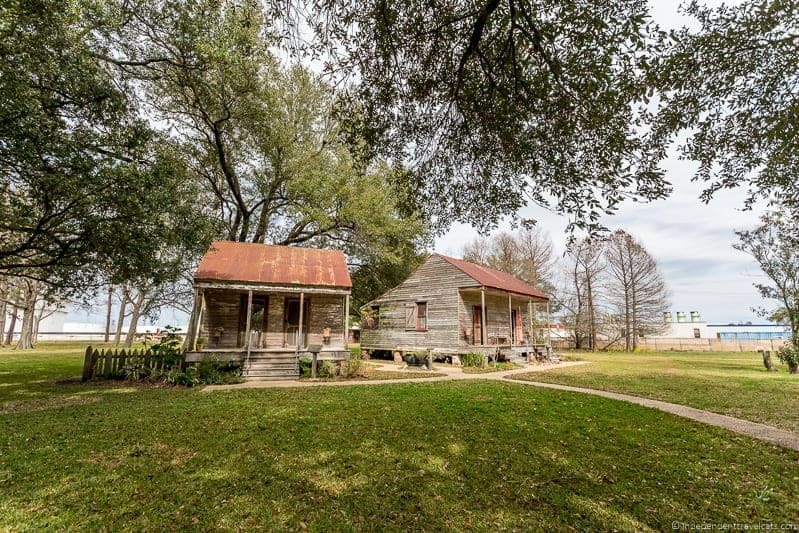 The majority of the buildings are antebellum, including the 22 slave cabins in their original sites; however, some of the buildings have been rebuilt or heavily restored. Evergreen Plantation and Whitney Plantation were both originally owned by German farmer immigrant Ambroise Heidel, and his sons would build the currently standing main houses at both plantations. Evergreen also possesses a beautiful alley of live oak tress, estimated to be about 200 years old. Evergreen Plantation is also known for being the setting of some scenes from Django Unchained and the 2016 remake of the Roots mini-series. Owners: This house was built by planter Christophe Heidel (son of Ambroise Heidel, his brother built Whitney Plantation) and his wife Charlotte Oubre as a 2-story raised French Creole villa and it was later covered to a Greek Revival house and expanded in 1832 by later owner Pierre Clidamant Becnel. 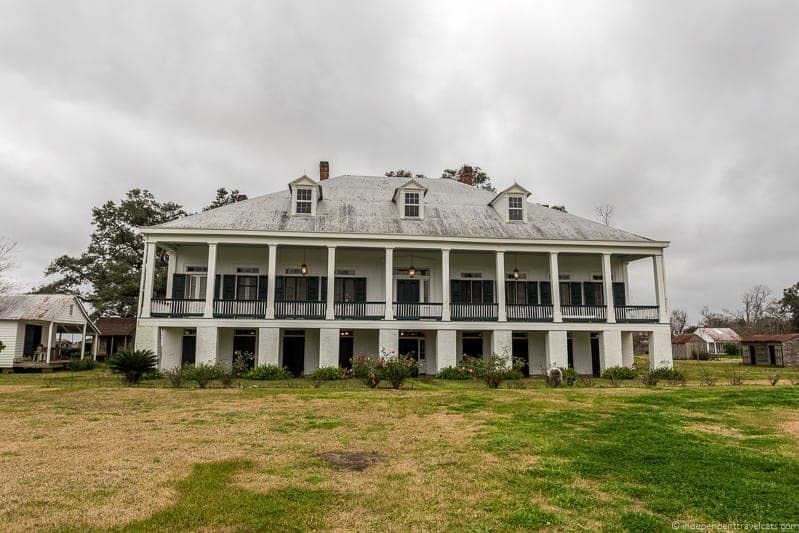 The Becnels would sell it to the Creole Songy family in 1894, the Songys would lose the plantation to the bank during the Great Depression, and then in 1946 it was purchased from the bank by Louisiana oil heiress Matilda Gray who used it as a second home. She restored, updated, and furnished the house, and at her death it was inherited by her niece Matilda Gray Stream who still owns it today. Tours/Tour Guides: Main house and grounds can only be visited on a guided tour. Tour guides are not costumed. Main House Furnishings: The house is furnished with period pieces from the 19th century, but also contains some modern pieces and elements as it was used as a residence until the end of the 20th century and is still sometimes used for entertaining. Other buildings to visit on property: The property contains 37 buildings on the National Register of Historical Places and is one of the largest and most intact plantation buildings in the American South. 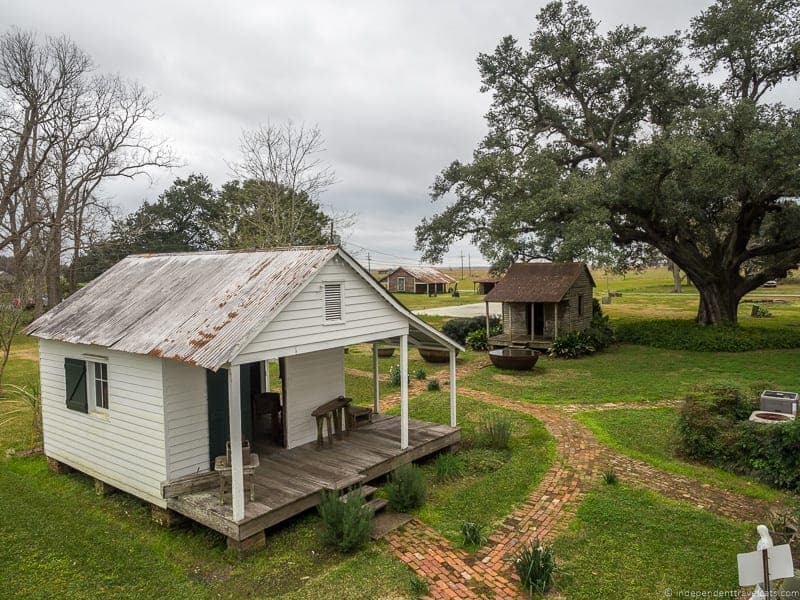 The buildings include 22 original antebellum slave quarter cabins, a domestic slave quarter, a detached kitchen (c. 1790, heavily restored), 2 garçonnières, 2 pigeonniers, a barn, and a Greek Revival privy (a.k.a. outhouse, 1832). Some buildings you can tour inside, and some you can view only from the outside. There is also a museum/interpretive center at the visitor center. Slavery Information: Moderate. A portion of tours at Evergreen Plantation are dedicated to the lives and work of the slaves on the plantation. There is also the 22 slave quarters buildings on the property for viewing and you get to go inside a couple of them. Gardens: Yes, there is a formal hedge garden behind the house. Accessibility: The main house of Evergreen is two story accessible by stairs only, and has approximately 15 steps total. The first floor does have 1 step up to enter. There are no ramps to this one step although a wheelchair can, with assistance, may be pulled up this step but would have access to the ground floor only. Most paths and roadways are gravel, grass, or brick. The kitchen has 2 steps and the slave quarter house has 4 steps, neither have ramps. The welcome and information center has a ramp providing step-free access, a wheelchair accessible toilet, and a disabled parking space. Days Tours Available from New Orleans: Yes, there are few tours options, including this tour (also includes Oak Alley, lunch, and swamp tour), this tour (also includes Oak Alley), and this private tour (private drive along River Road and visit to plantation of choice). Crowds: Small to moderate – this is not typically a busy property and is not as well-known in comparison to many of the other plantations. 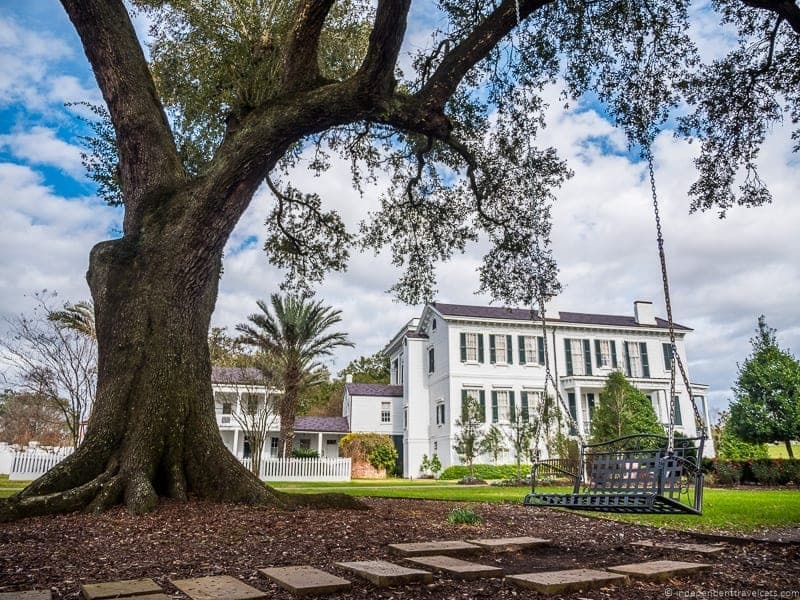 Most Unique: The number of historical buildings on the property including the 22 slave cabins in their original configuration, being one of the most intact plantation complexes in the South, and the photogenic alley of live oaks. It is also a working sugar cane plantation; however, the owner is not involved in the sugar cane plantation but leases the land out to others. Evergreen Plantation is the most intact of the Louisiana River Road plantations so there are a lot of buildings to view, although many have been heavily restored on the inside. The most significant is the 22 antebellum slave cabins still in their original position (at least one has been rebuilt, many restored) that sit underneath a portion of the picturesque alley of live oaks. The oak alley here is interesting in that it along the side of the house rather than in front of it. This oak alley has Spanish moss draping the trees (missing at Oak Alley) which helps give it a mysterious and eerie feel. Laurence and I did not actually have a chance to do the full tour here but we did visit the interpretive center/visitor center and spent 45-minutes with one of the tour guides at the center. The interpretive center is great to see before you start the tour so you can get an idea of the history of the plantation. After you buy your tickets at the museum center and get an introduction here, you’ll follow the guide by car to park nearer to the actual plantation house to start the walking tour. The plantation complex is amazingly symmetrical and the tour includes visits to some of the outbuildings (slave cabins, kitchen) as well as the main house. We can’t comment on the actual tour since we didn’t take it or visit any of the interiors. We were also told by both visitors and guides that there is an emphasis on slavery on the tours, although obviously not nearly as much as next door at Whitney. This tour is great for those wanting to see a largely intact plantation property (although furnishings are not original) with multiple outbuildings, a beautiful oak alley, and hear the history of the past owners, slaves, and current owners. 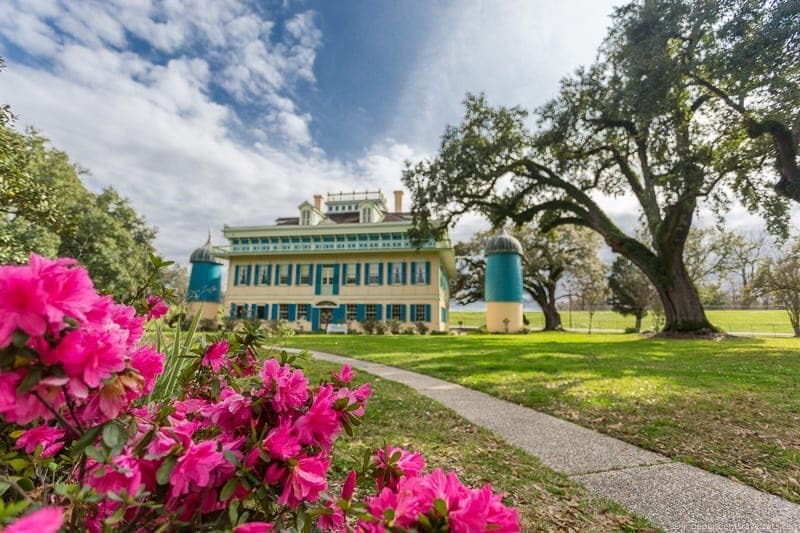 San Francisco Plantation is the most colorful of the Louisiana River Road plantations and although built during the antebellum period, it was built in the Gothic Steamboat style. Viewed from some angles, the house resembles the ornate and yet graceful structure of a Mississippi riverboat. The house was so architecturally distinctive that it inspired novelist Frances Parkinson Keyes to write Steamboat Gothic, a novel about a steamboat gambler who moves his family to Louisiana. The plantation also has an interesting history of ownership, it first become a sugar plantation when owned by Elisée Rillieux, a free man of color and businessman. He quickly sold it to Edmond Bozonier Marmillion and his partner Eugène Lartigue for a large profit, and it would be Edmond who would build up the plantation and construct the current main house. Sadly, Edmond would die soon after the house’s completion and only one day before the arrival of Valsin and his new German wife Louise on a visit from Europe. Instead of returning to Germany, they were forced to take over the sugar plantation and were stopped from selling it by the onset of the Civil War and Reconstruction. The name of the plantation is believed to derive from Valsin’s comment on the debt and cost of the estate, the French slang phrase “sans fruscins” which means “without a penny in my pocket”, becoming St. Frusquin. The name would be Americanized to San Francisco Plantation by future owner Achille D. Bougère. The house interior is distinctive for its painted ceilings and Southern German accents and motifs. Owners: This house was originally built by Edmond Bozonier Marmillion and then the plantation was run by his son Valsin Bozonier Marmillion and daughter-in-law Louise. The house then had a succession of owners. In the early 20th century, the house was purchased by the Ory family who lived here for about 50 years. In 1954, the Ory family leased the house to Clark Thompson and his wife who maintained the premises and opened the mansion to the public, living here until 1974. It was then purchased by the ECOL Company and later by Marathon Oil. The San Francisco Plantation Foundation was created and the home underwent a massive restoration, and is still funded and maintained by Marathon Oil and the trust today. Tours/Tour Guides: Main house can only be visited with a guided tour, but the grounds and other buildings are self-guided. Tour guides are costumed in antebellum period dress. Main House Furnishings: The house is furnished but none are original (except the wine racks), but the furnishings are period pieces. Other buildings to visit on property: The property also contains a slave cabin (c. 1840, moved here from another plantation) and a one-room school house (c. 1830’s) that can be visited. Slavery Information: There is a small amount of information on slavery on the main tour. There is also a slave quarters building on the property for viewing with more information. Gardens: No. Property does have flower beds and some majestic oak trees. You can see the oil refinery buildings in the distance which can detract from the beauty for some. 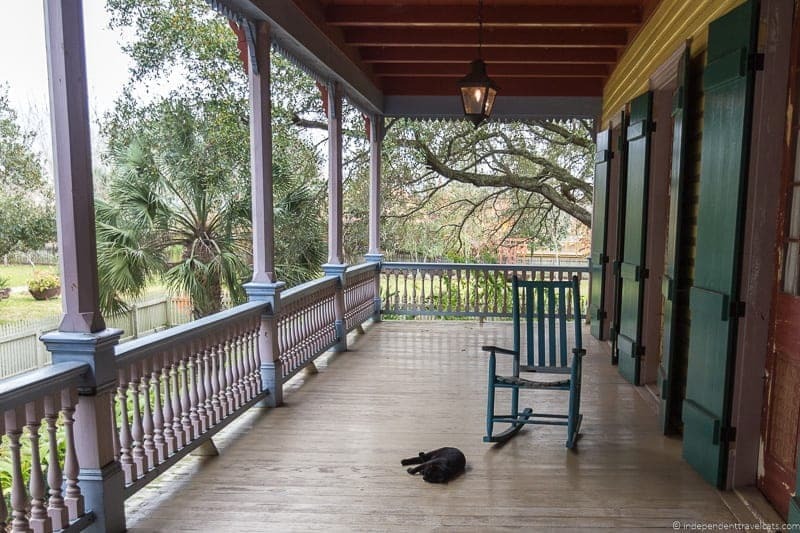 Accessibility: There is step-free access to the main floor of the San Francisco Plantation house but only the first floor of the house is wheelchair accessible. It is about 15 steps to reach the second floor of the house. Those who cannot do the second floor portion of the tour will receive a book about the history of the plantation that includes photos of all the rooms. The gift shop is wheelchair accessible. Paths on the property are concrete and there is a toilet on site that is wheelchair accessible. 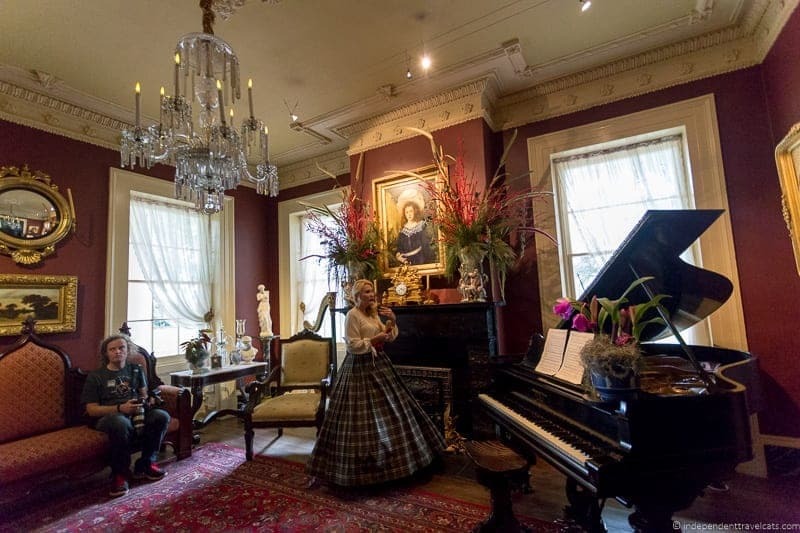 Days Tours Available from New Orleans: There used to several day tours available that included San Francisco Plantation, but they seem to no longer be taking part in any of the regular scheduled tours. You can arrange a private tour such as this one. Crowds: Small to medium – this is a popular plantation but not as well known as some of the other area’s plantations. Most Unique: Steamboat Gothic architecture, colorfulness of the house, and painted ceilings. San Francisco Plantation is a sort of microcosm of this area, a beautiful historical home surrounded by an industrial complex. The San Francisco Plantation Trust, funded by Marathon Oil, has spent millions of dollars researching, restoring, and maintaining this house. We think it is a great example of a modern industry helping to preserve a piece of history although some visitors may not enjoy glimpses of the oil refinery in the distance. The house itself has been restored to its antebellum look and it is quite unusual in its architecture and color; it really stands out among all the other River Road plantations. San Francisco Plantation can be visited for free with a New Orleans Pass, so we strongly recommend visiting here for pass holders. The guide was quite knowledgeable and some of the furnishings were unusual (copper freestanding shower), but one of the highlights of the house’s interior is the four painted ceilings which are in various states of restoration. The most fascinating aspects of the tour to us was the history of the family and imagining how difficult it must have been for Valsin Bozonier Marmillion to come for a visit to find his father had just died and that he was heir to a sugar plantation he never wanted. It was particularly difficult for his German wife Louise who wanted to return to her home in Germany. Louise would only do this many years later after losing both her husband and brother-in-law. It is also interesting that Louise’s German descendants only reconnected to the house in the 1980’s, not being able to locate it with its new Americanized name, and they provided Louise’s letters, photos, and documents that help provide richness to the current tour. 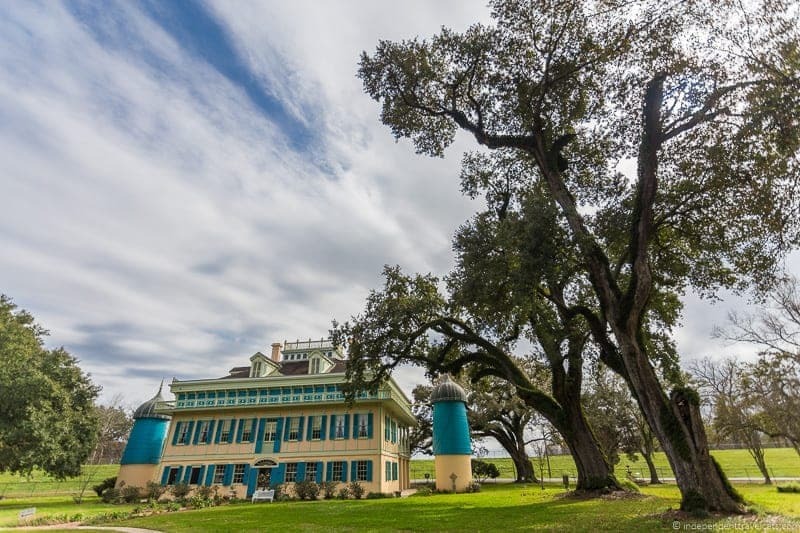 Definitely make a little time for walking around the exterior to take photos of this architecturally unusual house with its two flanking water towers and to visit the slave cabin and school house. This is a great plantation for those looking to visit a more nontypical plantation that has an unusual architecture and an interesting family story. Ormond Plantation is currently a fully operating bed-and-breakfast and one of the few plantation houses on the River Road that allows you to spend the night in the main house. The house also has a bit of a spooky past. The first owner, Pierre D’Trepagnier, was called away one evening from his family dinner by men who allegedly worked for the Spanish government (reminder that Louisiana was once held by Spain) and disappeared that evening to never return. In 1898, State Senator Basile LaPlace, Jr. bought the plantation and legend has it that in 1899 he was shot and hung in one of the large oak trees at Ormond Plantation by members of the Ku Klux Klan. Today’s owners however are a friendly hard-working family running the house as a bed-and-breakfast, restaurant, and also offering historical house tours by appointment. Owners: The house was built around 1789 by Pierre D’Trepagnier, who was awarded a tract of land by Spanish Governor Don Bernardo de Gálvez. After D’Terpagnier’s mysterious disappearance in 1805, it was sold to Colonel Richard Butler who would name the plantation Ormond after his ancestral home, the Castle Ormonde in Ireland. In 1898, State Senator Basile LaPlace, Jr. bought the plantation but died in 1899. The house would then be owned by a series of owners and became in quite a state of disrepair until being restored and renovated by Mr. and Mrs. Alfred Brown. 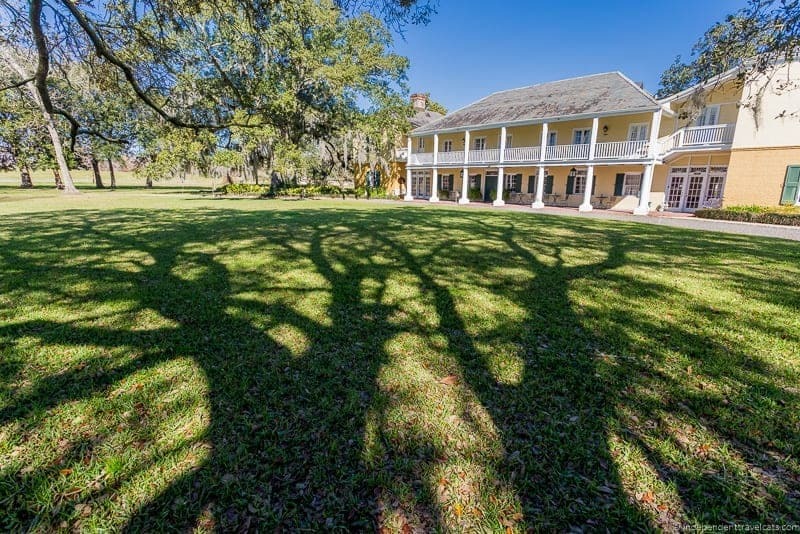 Today, Ormond Plantation is owned by the Carmouche family who run it as a bed-and-breakfast. Tours/Tour Guides: Main house can only be visited with a guided tour unless you are staying at the bed-and-breakfast. Tours for non-guests are given by appointment, just call ahead. Tour guides are not costumed. Main House Furnishings: The furnishings are not original, but many are antiques. Other buildings to visit on property: The property also contains two garconnières (c. 1830). There is also a collection of dolls on display in the main house. Slavery Information: There is a small amount of information on slavery on the main tour, but not much is known about any specific slave information at Ormond Plantation. Gardens: No, but there are a few grand old live oak trees on the property. 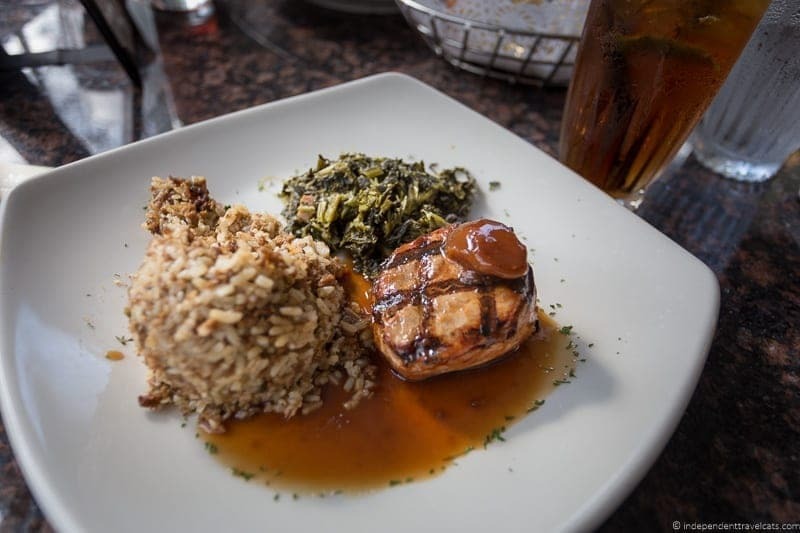 Food: Yes, the Ormond Plantation Restaurant serves lunch and dinner. Dinner is served on limited days and by reservation only. Accessibility: The main house at Ormond Plantation has step-free access to the ground floor and there is an elevator that can be used to take visitors to the second floor. The garconnieres do have two small steps and are not wheelchair accessible. The paths are wheelchair accessible and there are wheelchair accessible toilets available in the house. Some of the overnight guest rooms are wheelchair accessible. Lodging: Yes, 5 en-suite rooms are rented out in the main house and garconnières. The rooms come with breakfast and access to most of the house. Most Unique: Architectural style and that there is a bed-and-breakfast housed in the main plantation house. Ormond Plantation was one of the plantations we were lucky to be able to see during our trip as it was closed that week for renovations, but one of the kind owners invited us to come by to take photos and do a quick tour. It ended up being convenient since there were no guests staying at the time. We did not stay here, but the rooms looked wonderful and inviting and we would love to return for a stay and a meal. Everyone we encountered was also very friendly and we could imagine ourselves sitting outside on the back patio sipping drinks in the evening. The history of the plantation owners was quite fascinating, almost unbelievable, from the mysterious disappearance of Pierre D’Trepagnier to the alleged hanging of State Senator Basile LaPlace, Jr. by members of the Ku Klux Klan. This plantation is not a showroom for tour groups like many of the others, but a working, lived in bed-and-breakfast, so while it does not have the “wow” factor of some of the grand mansions and has been modernized, it felt authentic, relaxed, and comfortable. We recommend that those wanting to either have an overnight stay or a meal at a plantation house, check out Ormond Plantation. It is also a perfect place to escape the crowds of the more popular and busy plantations and is one of the closest plantation homes to New Orleans. Destrehan Plantation is one of the oldest and best-documented buildings from the state’s colonial period; the house was built while Louisiana was a Spanish colony. 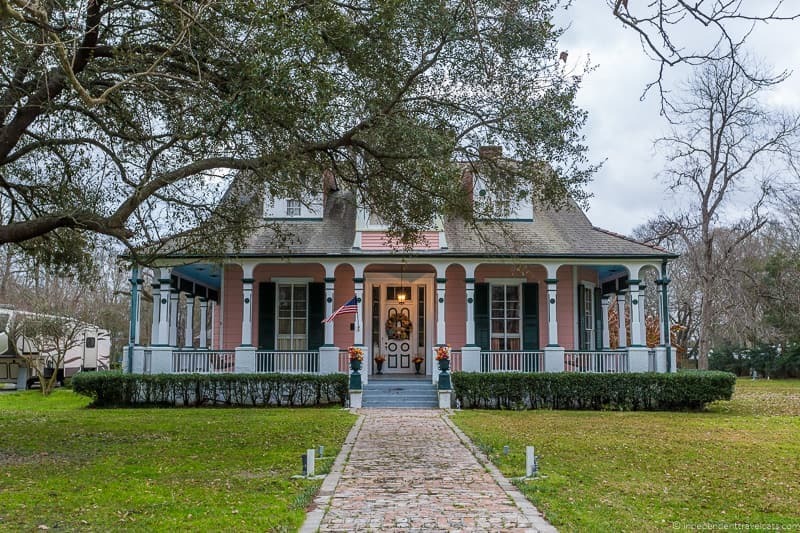 The house was completed in 1790 as a French Creole house and was later expanded and renovated into a Greek Revival home in 1840. Its history is fairly well-known and the main house has somewhat miraculously survived even after a multitude of owners and the property being turned into an oil refinery and company town. The plantation was saved by the River Road Historical Society and American Oil Company (now Amoco) and today the plantation features house tours, numerous educational exhibits, and period craft demonstrations. The plantation’s collection of historical artifacts includes a document signed by both Thomas Jefferson and James Madison assigning four men, including Jean Noel Destrehan, to the Orleans Territorial Council. Destrehan Plantation has also been used as a filming location, including for Interview with the Vampire (main house interiors) and 12 Years a Slave (1830 mule barn). Owners: The house was built for owner Robin de Logny by an enslaved man of color and master builder named Charles Paquet. After de Logny’s death, his daughter Celeste and her husband Jean Noel Destrehan took over the plantation. It would stay in the Destrehan family and extended Rost family until 1910. Louise Odele and Pierre Rost would renovate and restyle the house in 1840 to the Greek Revival style. It was then sold to the Destrehan Manufacturing Company and then to an oil company, which is now Amoco. They built an oil refinery and company site on the town and it was used as such from 1914 to 1958. In 1971, the house and about four acres of the plantation was deeded from Amoco to the non-profit River Road Historical Society from Amoco, who still manage and run the plantation today. Tours/Tour Guides: Main house can only be visited with a guided tour, but the gardens and other buildings are self-guided. Demonstrations are also given at various places on the property by staff and volunteers (see schedule in visitor center). Tour guides are costumed in antebellum period clothing. Main House Furnishings: Only a few of the furnishings are original, including a heavy marble bathtub; however, the rest of the furnishings are period consistent. Other buildings to visit on property: The property also contains a number of other buildings, but most are not original to Destrehan, but have been brought in from nearby plantations. The garconnières (part of the house tour), wash room, and water well are original. Other buildings include 2 antebellum slave cabins (original to Helvetica Plantation), a mule barn (c. 1830, original to Glendale), and an overseer’s cabin (original to Caire-Graugnard). Other buildings have also been constructed to hold the educational exhibits and demonstrations. Slavery Information: There is some information about slavery on the main tour. There are documents in the education center related to slavery, an exhibit dedicated to the 1811 Slave Revolt in the educational center, and there are two original slave/sharecropper cabins on the property (original to Helvetia Plantation) for viewing. Gardens: There is a rose garden and a heritage garden with sugarcane plants. There are also some grand live oak tress on the property. Accessibility: Within the main house at Destrehan Plantation, there is one step down into the plantation and then one step into the foyer, but there is a portable ramp available and an elevator to provide step free access. The inside of the plantation house can accommodate wheelchairs but not scooters. Scooters are limited to the carriageway. The plantation store has a ramp. There is enough space to maneuver and place a wheel chair inside the gift shop, plantation, education center, and outdoor kitchen. The slave cabin has stairs and limited space and are not wheelchair accessible. Wheelchair accessible toilets are available in the gift shop and near the plantation house inside the cistern. 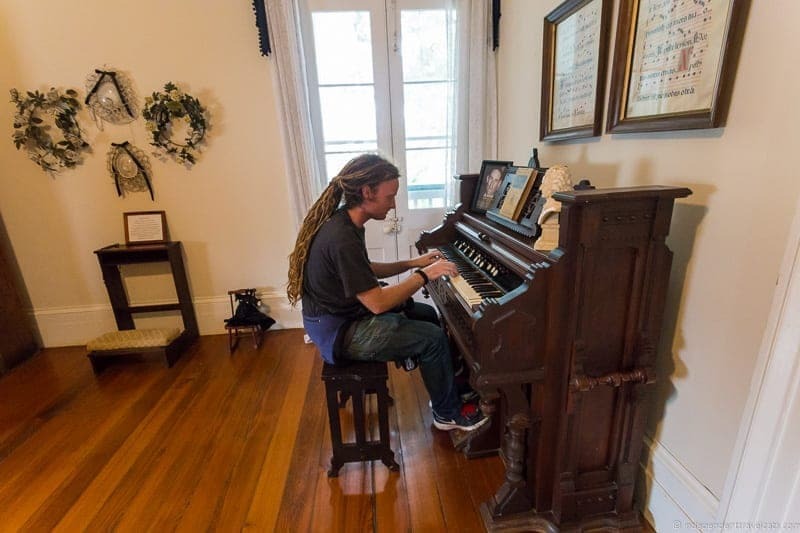 Days Tours Available from New Orleans: Yes, there are few tours options, including this tour (also includes swamp tour), this small group tour (also includes airboat swamp tour), and this private tour (also includes Houmas House for East Bank option). Lodging: Yes, there are two self-catering Creole cottages for rent on site that recently were refurbished as guest lodging. You can see them here. Crowds: Large – Destrehan Plantation is the closest plantation to New Orleans and because of its proximity, it gets a lot of crowds. Most Unique: The period craft demonstrations, focus on history, and historical documents, including one signed by Thomas Jefferson and James Madison. This is a great historical plantation property and of all the River Road plantations we visited, this is the closest one to New Orleans. It is less than 10 miles from the New Orleans airport and less than 30 miles drive from New Orleans. This proximity makes it convenient but more crowded as it is popular with day trippers and bus tours from New Orleans. We were lucky to arrive just after most of the bus tours and school tours had left for the day, so we actually had a tour that was just the two of us. Our guide was very knowledgeable and there are a lot of historical documents that have been recovered about the plantation, which gives a depth to the tour that will appeal to history lovers. Many documents, photos, and artifacts are available for viewing (many electronically) in the artifact room and the document signed by Thomas Jefferson is kept for viewing in a separate climate-controlled room, which we visited at the end of our house tour. Destrehan Plantation is a great source of information not only on the owners, but also the enslaved. For instance, we learned that the builder of the original French Creole house was an enslaved man of color named Charles Paquet, slaves from the Destrehan Plantation took part in the 1811 Slave Revolt and three were executed (Gros Lindor, Petit Lindor, and Jasmin), Jean Noel Destrehan was appointed on the tribunals after the revolt, and from 1865 to 1867 the plantation was used to establish a Home Colony for newly free slaves. Hundreds of former slaves were housed and fed on the Destrehan Plantation property following the end of the Civil War. We also were able to attend two of the period craft demonstrations that were going on during our visit, one on open hearth cooking and one on blacksmithing. We ended up buying one of the demonstrated blacksmith pieces from the gift shop. There are about a dozen different craft demonstrations and lectures that happen each week which also include candle making, indigo dyeing, use of the laundry, weaving, and African American herbal remedies. We felt that Destrehan Plantation offered a very well-rounded experience complete with a guided house tour, a lot of historical information, antebellum outbuildings (although most not original to Destrehan), educational exhibits, and period craft demonstrations. There you have it, probably the most complete online guide to Louisiana plantations along the River Road between Baton Rouge and New Orleans! Feel free to ask us any questions about any of the Louisiana plantations we visited. Have you been to any of these plantations or have any of these on your bucket list? Feel free to share any advice or tips of your own and please share any information updates. Also, if you found this guide helpful in your trip planning, we’d love to hear from you! I really enjoyed this article. I did this river road drive in 1987 so reading this brought back some great memories. We did only tour 2 plantations, Oak Alley & Nottaway, but we stopped & took photos outside all the others. I also took pics of each historical sign. I did notice you did not mention Indian Camp. I had never heard of it till the day we drove that road. Though a tour would not be on the agenda, it is def. worth stopping for a photo & pic of the historic sign. Thanks for the memory refresh with this read. Hi there, Yes, so happy you enjoyed our River Road Planatations post and that it brought back some good memories. Many of these plantations have been restored and opened to the public since 1987, and the tours have definitely changed a bit over the years. I think for Indian Camp, you are referring to the old Woodlawn Plantation (often called Indian Camp). The sugar plantation would later become part of the leprosy hospital in Carville which is definitely an interesting place to visit! It was open until 2015 but since then part of it has been opened to the public as the National Hansen’s Disease Museum. We actually saw a play about the hospital museum performed a couple of years ago at Edinburgh Fringe. So if you ever go back, it would definitely be worth a stop! Hi! I’m glad I found a link to your information on Pinterest. When I have a little more time I will go back and read everything more carefully. When we first decided to take a trip to louisiana, one thing on our list was visiting a plantation. I started reading on TripAdvisor about those we might choose. Although there were a lot of good reviews, there were also enough terrible reviews for each place that couldn’t be ignored. There were many issues, which disturb me, but one consistent was that people felt like they were being herded through the house quickly. Sometimes the tour groups were so large that the last people to reach a room did not get to hear what the guide was saying because they wouldn’t wait for the people to get there. I’d like to know if you ran into any issues where you would warn us against that particular place. I apologize if I am asking something that someone else has already asked, or if you have addressed it elsewhere. You have given us so much to digest and I hope to get through it as soon as I can. I appreciate your information. Thank you, Jessica. I’ll be taking everything you say into consideration. Chances are we won’t ever have another trip to NOLA, so we want everything to be as good as we can plan it for this time. Living in Texas, we have the same nasty hot, humid weather that Louisiana has, so we know not to go during the worst months. We’re hoping to find some cooler weather in the fall, and maybe the crowds and tour groups won’t be as large then either. Thanks so much for all the information. Wish we could see all of them as you did, but maybe we’ll do two since we’ll be out there! Traveling through this area on my way to Fort Walton Beach, Florida for a beach vacation. Wanted to tour one or two plantation homes, but had no idea which. Other articles I read didn’t help me much at all, but this one was perfect! I read every word of it, and I have now narrowed down my choices somewhat. Thanks so much for such a fun and informing article. Wish I was a travel writer!!! I’ll be in New Orleans for a couple of days next month and a trip to a plantation house is definitely on the list and this makes it so much easier to choose. So, thank you so much for writing it all down so nicely — the excitement is growing even more. Thank you so much for your wonderful post! I was especially happy to see a photo of Susan, a guide at Houmas House!! She was our guide several years ago, and she was a blessing to spend time with. SO happy to see she is still a guide at Houmas House and doing well! Wow! So glad I found this. You have done such a wonderful job and I thoroughly enjoyed reading all the fascinating information. I would love to see some of the plantation homes with my daughters. Perhaps a future trip. I have only visited Houmas House. It was many years ago. Of course I was terrified by “Hush Hush Sweet Charlotte” as a child & this was part of the lure. I am sad to say that I don’t think I like the remodel of the house, from what I can see in the photos. When we visited I remember wallpaper? Not sure if it was original, but I believe it was in the foyer or area with the staircase. Some sort of mural type wallpaper. The current owner’s taste looks rather tacky (good southern word). A shame. I would still love to revisit the place.The tour sounds like it has improved. I picture our trip being on a long weekend. We live outside Houston and I am wondering if we could fly into Baton Rouge and leave via New Orleans. Also wondering out of all the plantations where you can stay overnight, which two you most recommend? We may have to narrow it down a bit. Not sure we can cover this many plantations in such a short time. If we had to choose only six, which would those be? I know, very hard decision. Thank you again for your wonderful article. Hi Ann, Glad you found our article on the River Road plantations in Louisiana helpful in planning your next trip. Yes, I think that the Houmas House has definitely changed with the new owner and he is a dog lover and a collector of lots of things – I think it would be interested for your to revisit the property to see it again. Let’s see – yes I think flying into one city and out another (Baton Rouge and New Orleans) is a good way to do it or since the two aren’t too far apart you could probably do a round trip if it saves you on rental car return. I would definitely not recommend visiting all of these, especially if you only have a few days to visit. If your trip is only going to concentrate on plantations (not visiting New Orleans or Baton Rouge) you could easily do six plantations in 2-3 days but you’ll need to plan ahead as not all are open daily. But I would choose 2-3 each day you want to visit and then really spend time visiting them with leisurely meals in between. 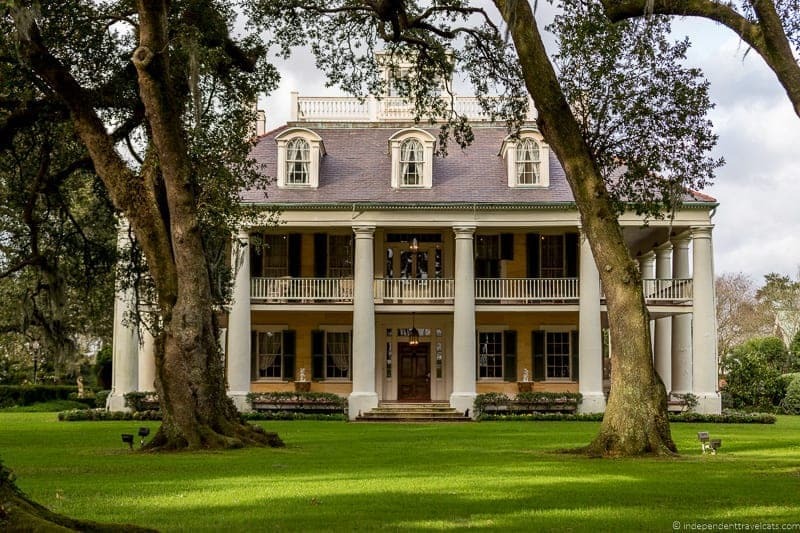 For an overnight stay, I would choose one of the grander and more popular plantations for one night (Oak Alley, Houmas House, or Nottoway Plantation) and a lesser known plantation for the other (Ormond or Poché) – I would base this partially on your route and where you plan to visit each day so you don’t have to backtrack too much. You might also want to do at least one stay where you actually get to stay in the main house (e.g., Nottoway, Ormond, or Poché). In terms of which six, it really depends a lot on your particular interests. Are you interested in romanticized plantations, costumed guides, slavery, antiques, craft demonstrations? Looking for lesser visited plantations to escape the tour buses? I would recommend trying out ones that are going to be different from one another – so for example Magnolia Mound Plantation for its history and antiques, Destrehan for its history and craft demonstrations, San Francisco for its unique architecture, Laura for its focus on the people that lived in the house, Houmas House for its gardens and restaurant, St. Joseph for being a working plantation, Whitney for its focus on slavery, Nottoway or Oak Alley for its beauty, Evergreen for most intact plantation, etc. Read my descriptions and just choose the ones that sound best to you, no reason to go to a plantation that doesn’t look or sound interesting to you personally! I have good memories from all of them actually as I love learning new thing and visiting new places – they are just different. One place that sticks in my mind is probably St. Joseph Plantation, just because you often get a tour from people whose family lived in the house and still work on the plantation. It felt very authentic. I am very intent on acquiring an enlarged c-print of your evening photograph of Oak Alley Plantation’s Great House, as seen through the darkening entrance of its magnificent oak trees. When convenient, please provide a cost for a minimum crop size of approximately 19″w x 17″h mounted to a masonite panel. Col. Will Thornton, USMCR, Ret. Thank you for such an informative, well-written guide on these homes. You provide much more detailed information than the tourism bureaus. My husband and I–plus our dog–are RVing to Mississippi and Louisiana to visit Vicksburg, Natchez and the River Road plantations in April. Oak Alley was definitely on our list but we were unsure which other homes to visit. Your guide will be so helpful as we make our picks. I appreciate that you took so much time to write and compile this much information, particularly noting special interests such as history, architecture and photography. I look forward to reading more from you in the future–you ‘re now a “go-to” reference! What a fantastic article. We were planning to see only one plantation. After reading your detailed information we will have to book one more night in New Orleans and see more plantations. Thanks for helping us to make decision. Thank you for a thorough review of our area. I will be sharing on our social media. I have the pleasure of working with the majority of these homes and owners. Thank you for sharing our history and the beautiful pictures! This is wonderful – you really did your homework! When can I find a map to plot our trip. Always wanted to visit this part of the US. Looks amazing! Such a useful and fascinating guide to the plantations of Louisiana. Your pictures are as wonderful as ever. I think your tips are particularly helpful especially with regard to the sensitivity needed when visiting these plantations. I’m surprised to read that most don’t focus much on the slavery aspect of plantation life. I would love to visit some of these. 12 is a lot of plantations to visit! You do a great job differentiating them so this is a great guide. Those with grounds are sometimes the best ones for younger kids, who don’t do so well on house tours. I have enjoyed the tour through all these plantations. How long it took you to visit them? I know people will visit the plantations for different reasons but I will be interested in the historical aspects of them. You mentioned there were visitors/owners descending from owners and slaves. It will be interesting to heard their stories about the time when plantation where prospering. That is one thorough post! I’ve been to three of these plantations, but you made me want to see the rest! Thanks for sharing. Thank You for including the lesser known plantations such as Poche Plantation and it’s RV Resort. Camping on an actual plantation is an experience greatly enjoyed. There is a resturant on Poche grounds as well as an official US Post Office. Thank you for this comprehensive guide of the 12 River Road Plantations. I didn’t get to see but some of them when I was there, but I have to say that reading your post I felt like I visited all of them. This post will definitely be bookmarked for future reference and shared on my FB and Twitter. Lots of valuable information in good photos. I’ve not been to the Louisiana plantations… what a thorough review of all there is to see! I have been to a couple in SC, and I have to say that I found the experience remarkable. It touched me in a variety of ways, from learning about the lifestyle, to seeing the truth of what it took to run these operations, and to simply experiencing the way many Americans lived their lives. They are both beautiful and touching at the same time. History never disappoints! Wow, this is an amazing post, chock full of valuable information! I read about the Whitney earlier this year and have been thinking of visiting, hopefully before the summer ends. Thanks for such a detailed post, I’m bookmarking it to help me plan my trip. Thanks again! Can I get your opinion on the best 3 day tour. Friend and I are very interested in visiting, especially from a historical perspective. Somewhat familiar with the area. It would be easy to see a lot of these Louisiana plantations in 3 days. -If you are asking about a guided tour, you’d have to arrange a private one as the group ones offered are just day tours from New Orleans. -If you are asking about a self-guided tour, I’d recommend starting in either Baton Rouge or New Orleans and then just following the River Road, to the other city. The map in the article shows you all the locations so you can plan your route. In terms of time, you can visit 2 to 3 plantations each day without being too rushed, and just choose the ones that sound most appealing. All of the River Road plantations offer some great historical info, but the ones that stood out a bit more from a historical perspective were Destrehan Plantation (probably the one with the most documented history), Magnolia Mound Plantation, Evergreen Plantation, San Francisco Plantation, Laura Plantation, Whitney Plantation, and St. Joseph Plantation. -I’d also recommend taking in some of the other local history as you go through by stopping in the some of the towns. One great history stop is the National Hansen’s Disease Museum in Carville which is located on a former plantation. The site is across the river from Nottoway Plantation. There is also the River Road African American Museum in Donaldsville. Some great historical sites in both Baton Rouge and New Orleans as well of course! Hope this helps – let me know if you have further questions!